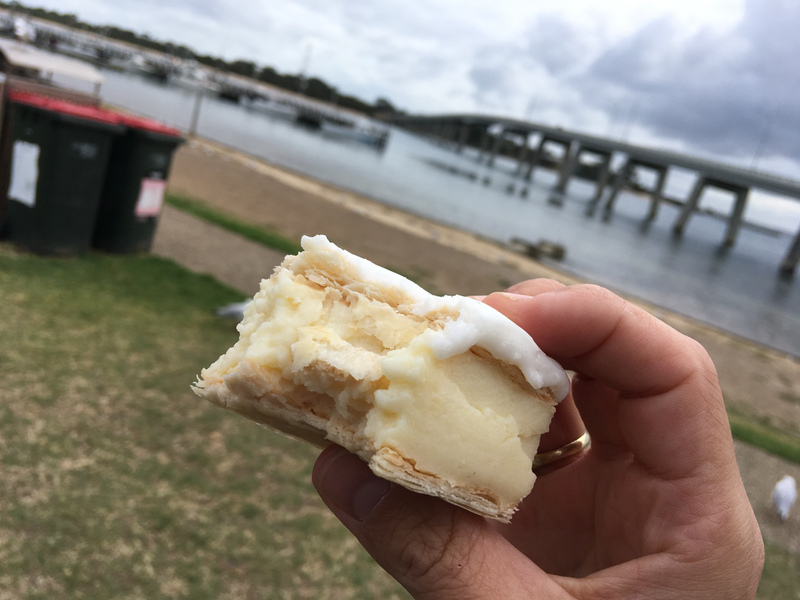 Stopping at San Remo to catch the pelican feeding, I indulged in a vanilla slice to snack on as I walked. It proved to be quite a disappointment. 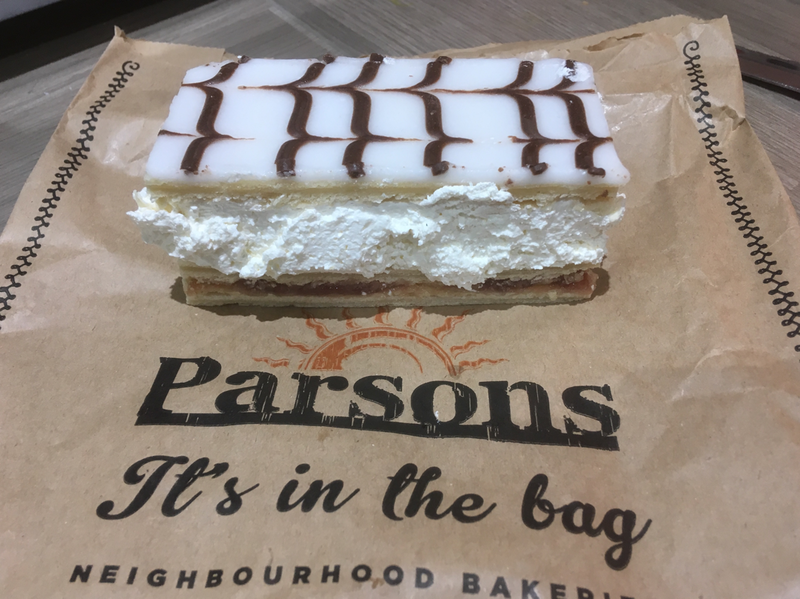 Compatrible in characteristics to a Ferguson Plarre slice, though not as tasty, it was let down by lacklustre pastry and heavily set custard. It was most likely baked the day before as the sheets of pastry had become soft and flexible when picked up. The custard too barely moved, and in fact aided the slice from falling to pieces like an adhesive. It also lacked notable vanilla content, creaminess and of course, a terrible texture. The icing was the best element, but icing alone cannot be enough to win me over. If only I was allowed to feed the pelicans with my unwanted slice, I wouldn’t have had to throw it in the bin. 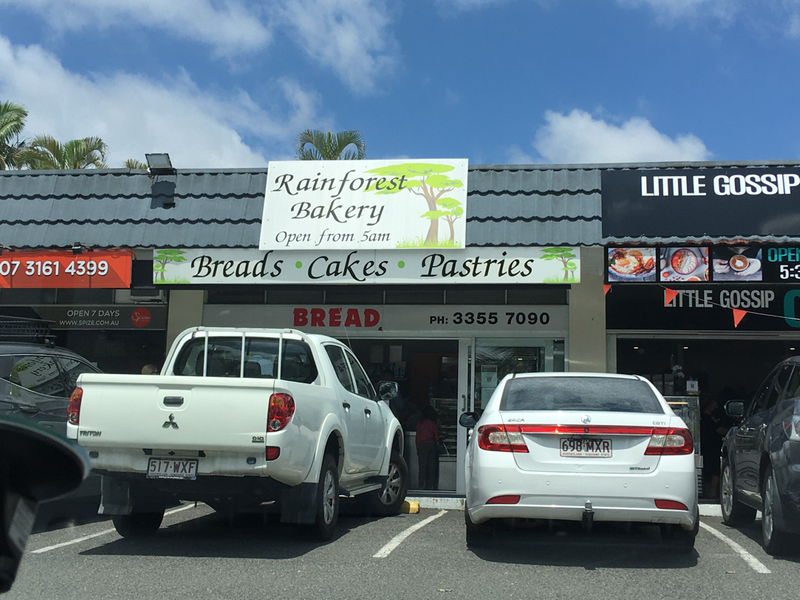 Interesting to note that San Remo Bakehouse offer discounted “yesterday’s bread”, but clearly not the case with their other products. 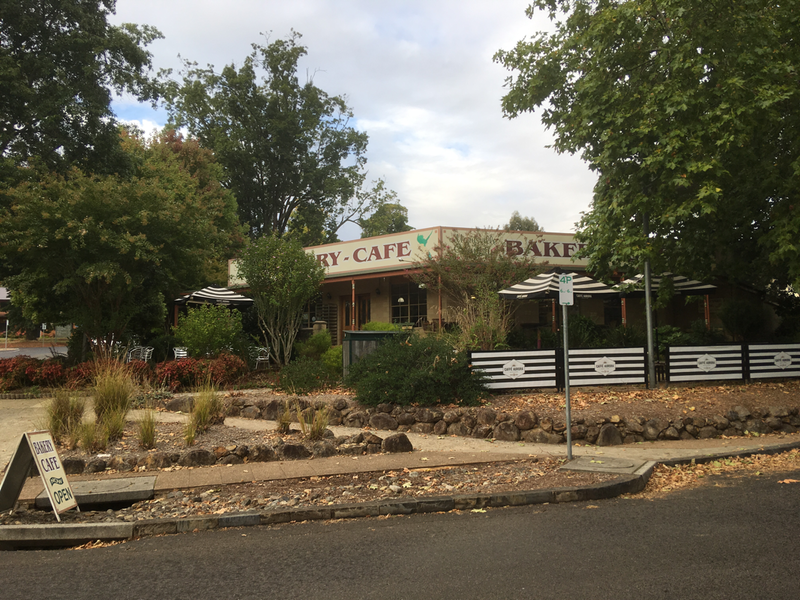 With a trip out to the country came and opportunity to grab lunch on the go from Marysville Bakery. With the town seemingly to myself on a quiet morning I breezed in, ordered and disappeared in a flash. Selling at $4 a pop the vanilla slices looked pretty good in their takeaway boxes, with a fresh, fluffy custard most notable. In my first bite I inhaled some sugar which brought about a coughing fit, but I pushed through and ate the slice in no time. 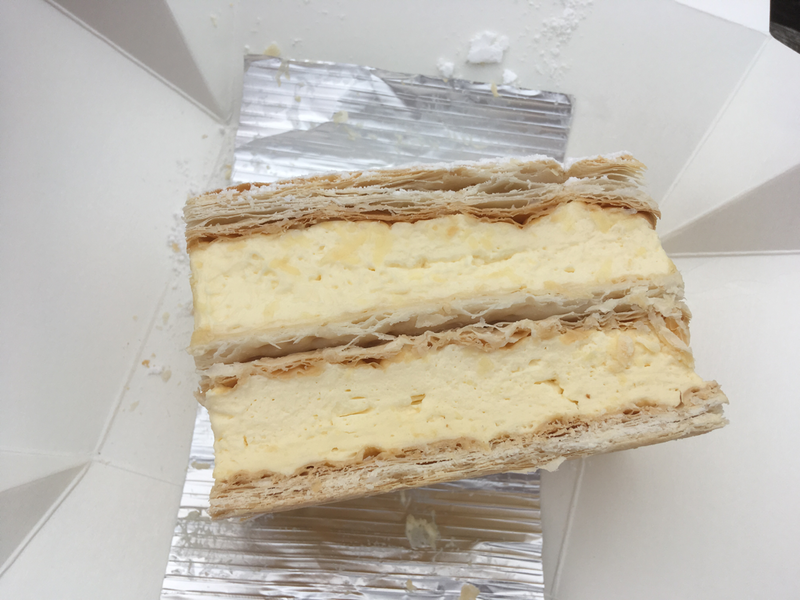 The pastry gave me reassurance of freshness, with a nice crunch with each bite, though the actual flavour and richness was not as good as it could have been. The custard was probably the best element; with a smooth, creamy and light consistency that oozed out of the sides with each bite. I narrowly avoided a custard spillage, successfully transporting all contents into my mouth with military precision. Not a bad stop, great curry pie is also worth noting. An interesting Greek twist on a vanilla slice that was a desert at a friends daughter’s birthday party. 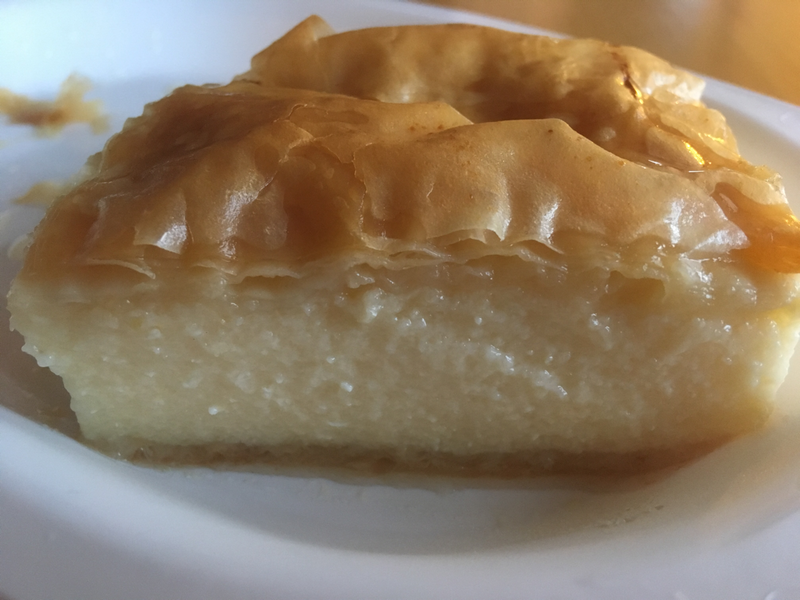 Similar in concept to baklava, but with baked semolina custard filling, the pastry element is filo soaked in honey or syrup. A rich golden colour and wafer thin, it had more than a hint of cinnamon and was delicious. The custard too was really tasty; full of egg, a hint of vanilla and a slight semolina texture, also allowing it to remain rigid enough to be cut and portioned. With only the two elements to concentrate on I took out two slices of this and would go back for more if I could. Better than birthday cake for sure! 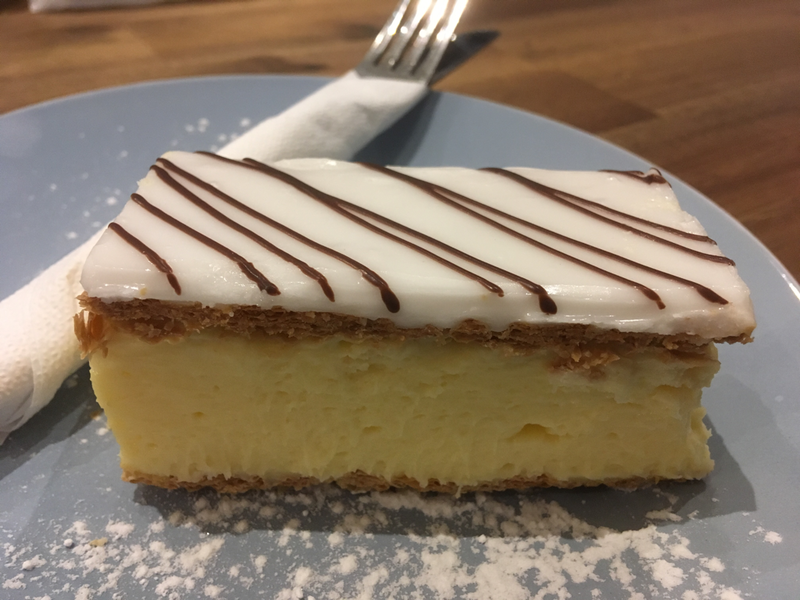 Not quite a vanilla slice as we know it, but effectively the same elements. 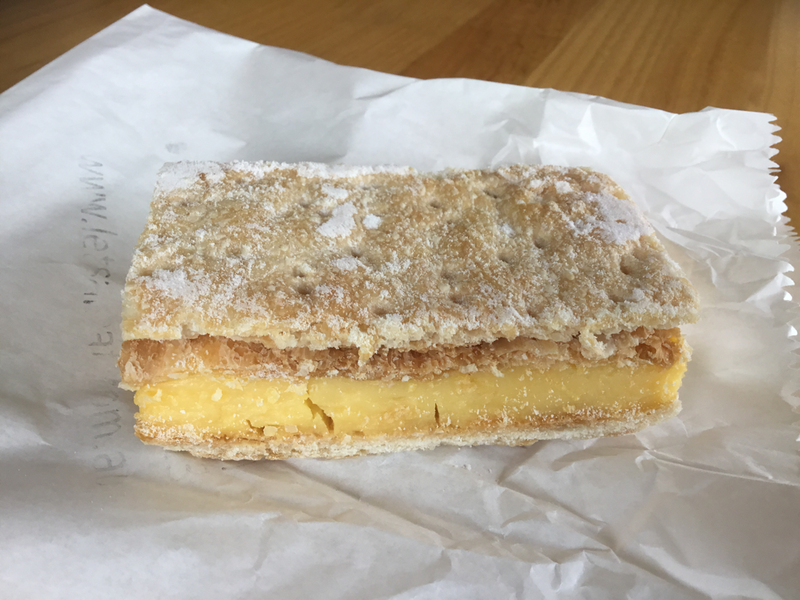 I was duped into buying this vanilla slice with only limited visibility of the shelf it sat on in Edgar’s Road Bakery Cafe. Had I seen the anemic pastry and set yellow custard it would have been a ‘walk slowly backwards and exit out the store’ moment. So when I unraveled the packaging in my car and took one look out of this thing, I knew it was going to be awful. I tentatively took a small bite from a corner, to discover that I wouldn’t attempt to even consume the ‘pastry’. Thick and uncompromising layers, they tasted somewhat like cardboard - totally disgusting. The custard was scraped out with a fork I had in the glove box and was just the right side of terrible. 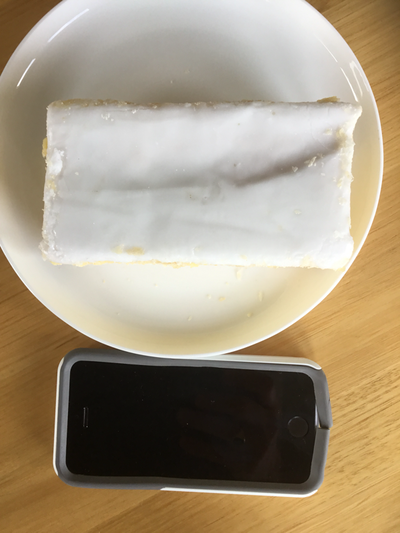 With the pastry out of action I too ignored the slab of icing on top, seeing no need to indulge in a kilo of sugar unnecessarily. I’m pretty sure that even the one in the school canteen tastes better than this one. Never again will I buy something I cannot fully see; lesson learned. A short pit stop on the way home from the park uncovered a new (or old) milk bar down Hoffman’s Road. 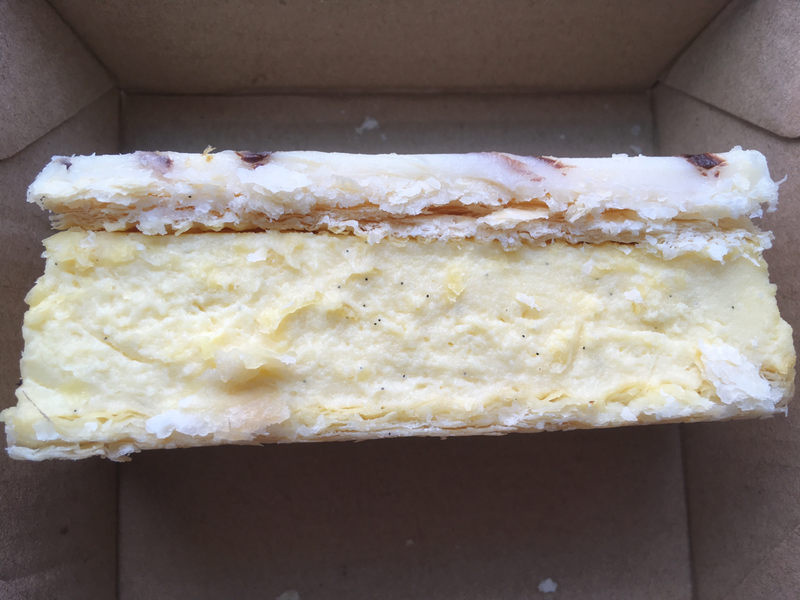 My son and I sat down, he enjoyed his icy pole whilst I got a vanilla slice brought over to snack on. 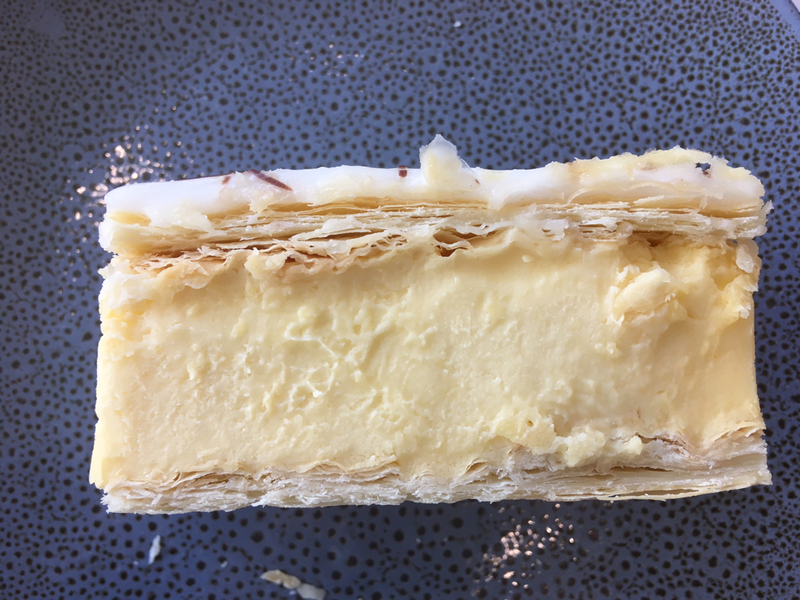 The discolouration of the filling around some of the edges was evident upon close inspection, plus some layers of pastry that still looked a bit raw. Indeed this was the case when bitten. The filling was nothing more than a standard pudding mix that had been set with a hefty dose of gelling agent, clearly not freshly assembled due to the crusty and darker shade of mix around the edges. The pastry too was weak, very blonde in colour, lacking butter, richness and translucent in patches. Though the components themselves weren’t great the overall taste wasn’t too bad, with a nice sweetness to finish from the half decent icing. Nevertheless, I didn’t finish the slice and left the crusty, unbaked areas on the plate upon exiting. 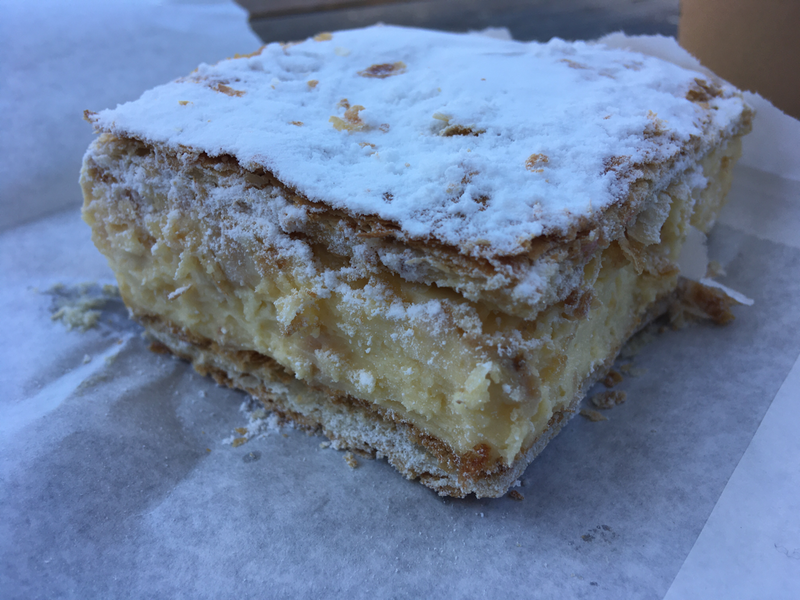 Friday night, an hour to kill in Hawthorn after work, what else better to do than grab a burger and a vanilla slice from Glenferrie Road? Having never ventured into Picasso’s Cafe before, I wasn’t aware that they sold so much freshly made food, I naively assumed they were a pizza shop. I optimistically ordered two and sat down with my colleague Custard J, for us to both devour in house. 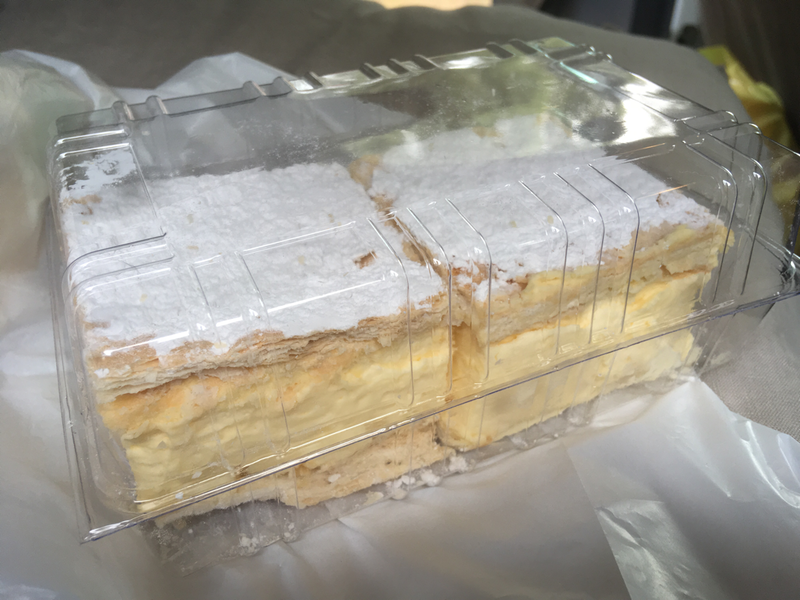 Served with a dusting of icing sugar and wrapped cutlery, I was satisfied with the initial quality of the product for a reasonable $4. J attempted a few cutting techniques with no luck, until I showed him the 90 degree rotate, tong grip, knife slide, tried and tested method I’ve come to adopt with utensils. Cutting into small pieces, it was immediately evident that the pasty was fresh, but exceptionally tough. Baked in tightly compacted dark brown layers, the texture proved quite dry instead of rich and flaky, potentially lacking butter content. 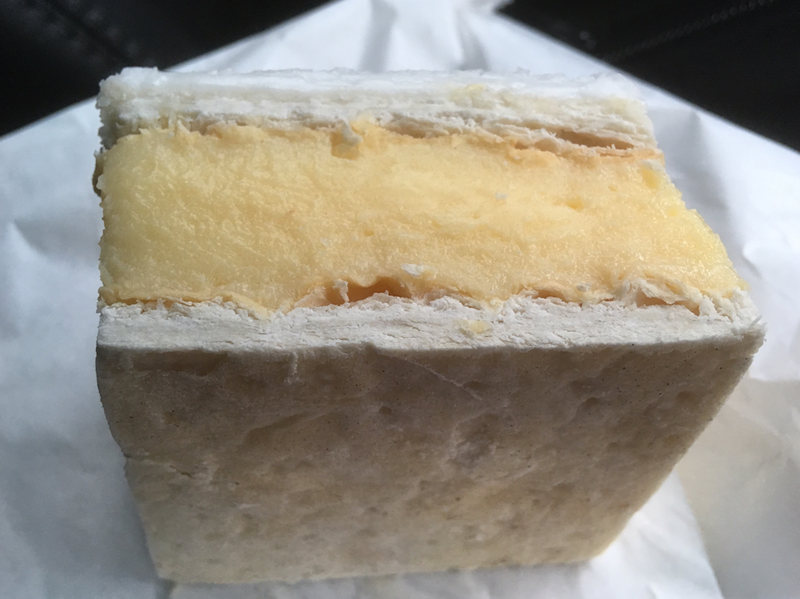 The custard had a dark yellow colour and looked appertising, until the first cut revealed a more set texture than anticipated. Though creamy, sweet and flavoured with vanilla the custard lacked a bit of ooze when cut. The real suprise came from the seemingly traditionally constructed icing, with white, glossy fondant drizzled with chocolate. Wrong. Coffee to be precise. A sweet, quite intense coffee flavour finished each mouthful, like a tiny shot of espresso, rather refreshing and completely unexpected. A debut critique from J in the company of a connoisseur, with some shared satisfaction from a reasonably well executed slice. 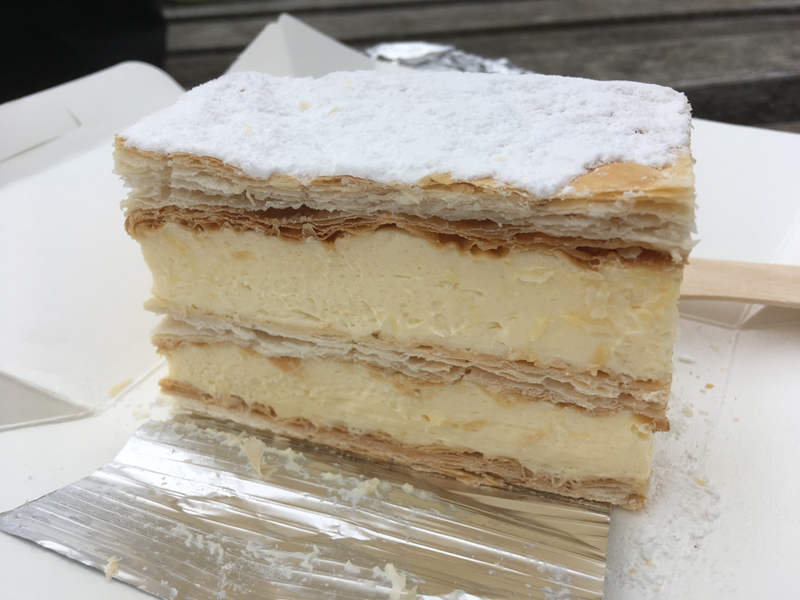 It’s easy not to be seduced by the homemade appeal of this Goliath vanilla slice in Mount Martha. 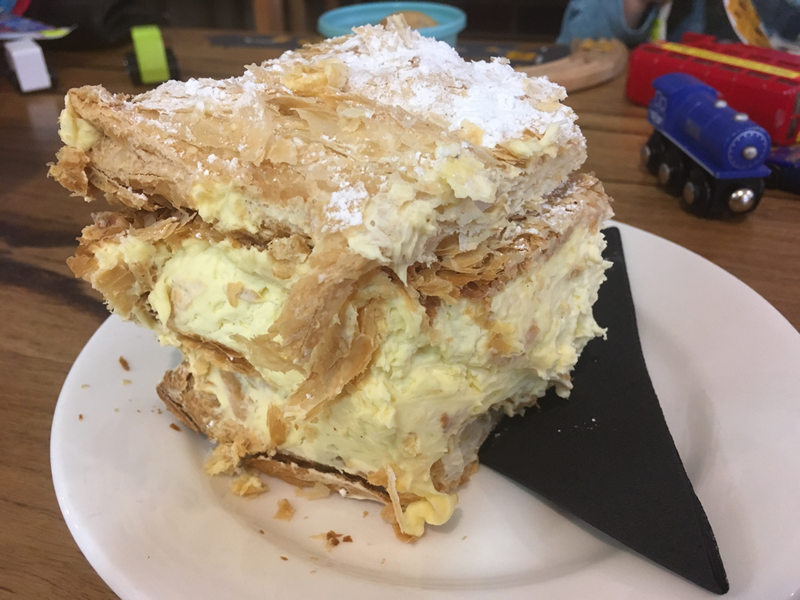 Undoubtedly the largest slab I’ve encountered in my time doing the blog, this thing sat unpredictably on my plate for a good few minutes prior to me beginning its deconstruction. With a few items to compare scale in the pictures, including my boy’s actual 1:1 scale London bus, you can clearly see the scale of the task. 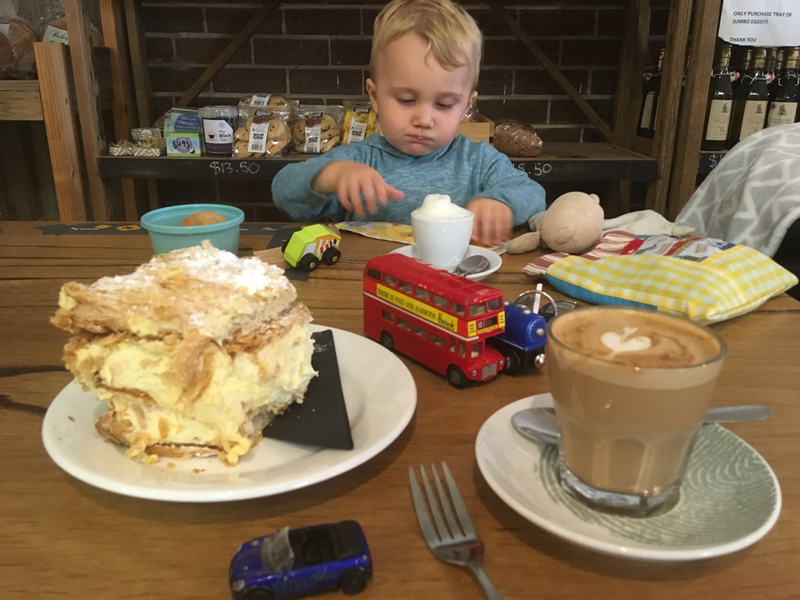 Easily enough for two, maybe three cake enthusiasts, it’s a shame my son is dairy intolerant as I might have let him loose on my leftovers here. 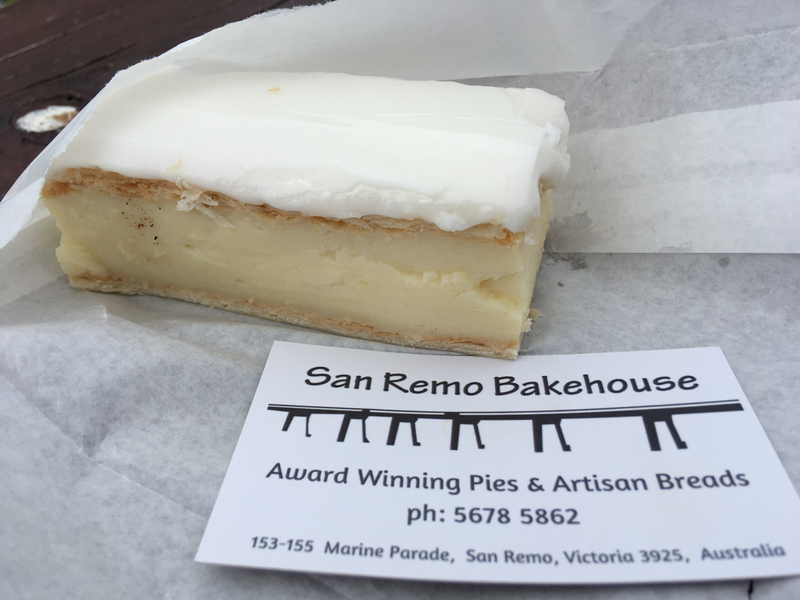 I’ve noticed that most of the slices I’ve eaten down the peninsula are larger than average, with successes occurring at Just Fine Food, Mount Martha Fine Foods and Baked in Sorrento. Sadly, this one did not follow suit in the pursuit of greatness. 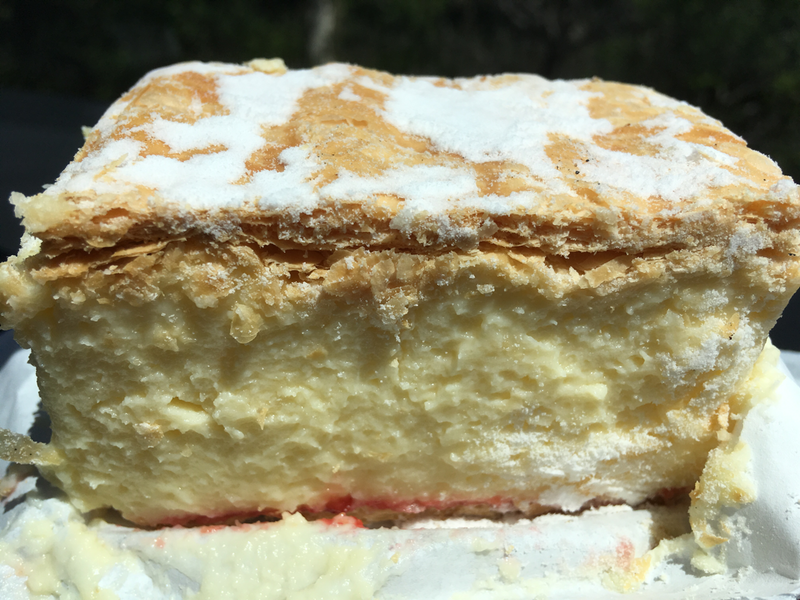 Though impressive in its construction and somewhat rare to see homemade puff pastry puffed to this extreme, the two layers on their own probably scaled 60mm. Thrown in between these sheets must have been a at least 500ml of whipped cream, sweetened and flavoured with vanilla. The sheer amount of ingredients almost killed me, and I had to stop with a third of the slice remaining. 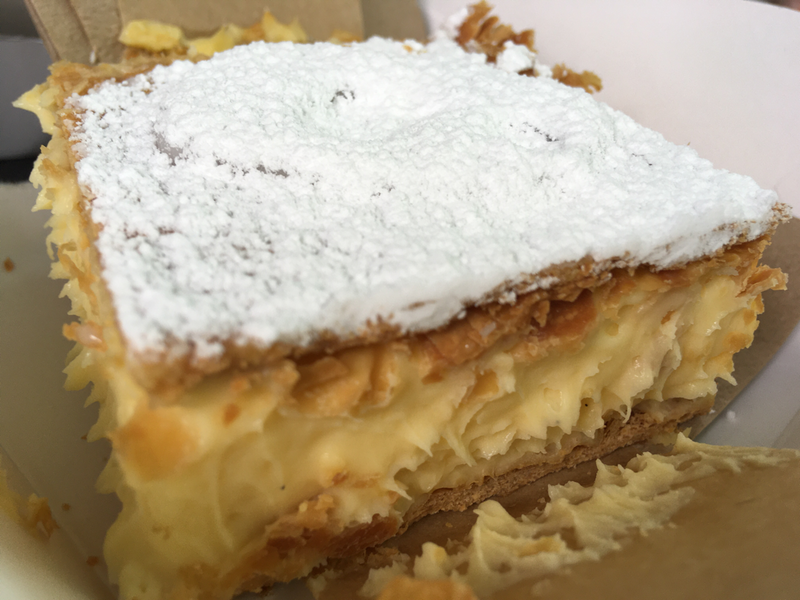 The pastry seemed fresh, extremely crumbly and messy, and quite light due to its level of puff. 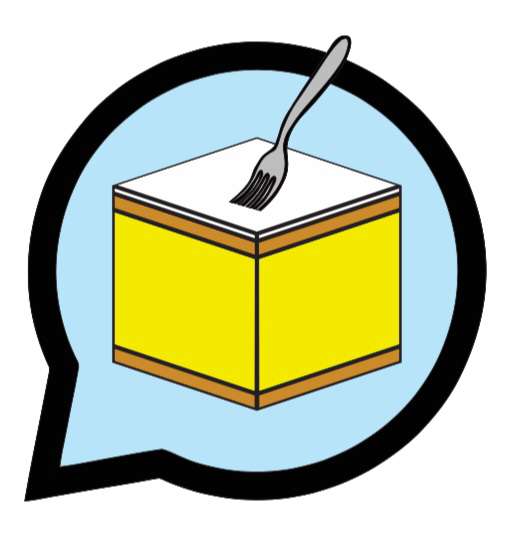 It clearly contained butter in the mix and a golden brown baked colour was instantly identifiable. The filling is what let the slice down. Normally I crave more, but this was just too much. I must admit, it was fun demolishing it with a fork! 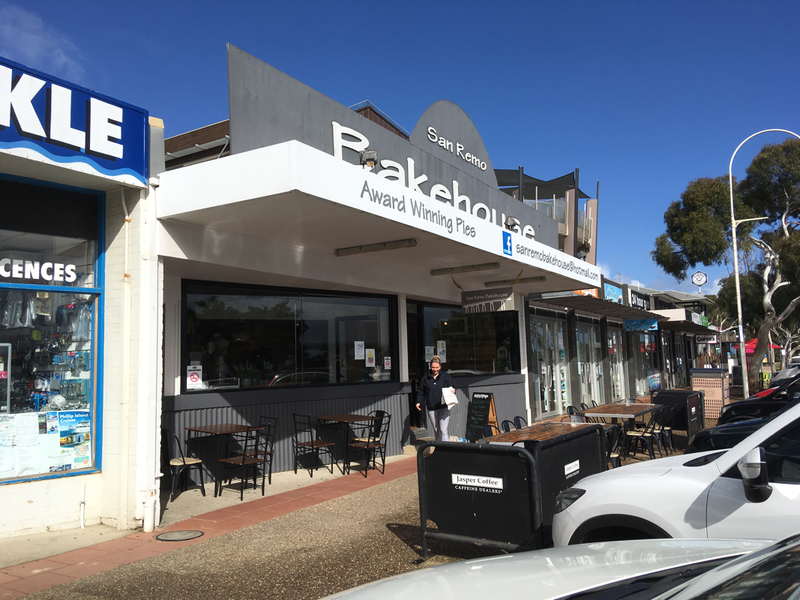 With only a handful of bakeries to choose from in the immediate area, I opted for a pit stop in Fawkner. I’ve never been to Bonwick Street, in fact I never knew the village existed. 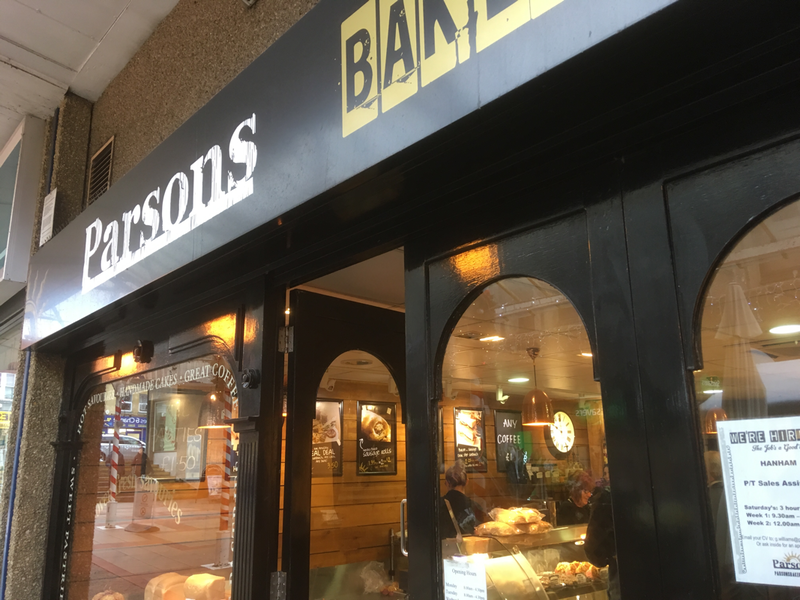 A half decent little parade of shops, with some trendy cafes and a few bakeries, I’m sure I will pop back at some point for another vanilla slice from a nearby competitor. I was drawn into the Italian Pasticceria offering a huge array of creatively presented sweet goods. 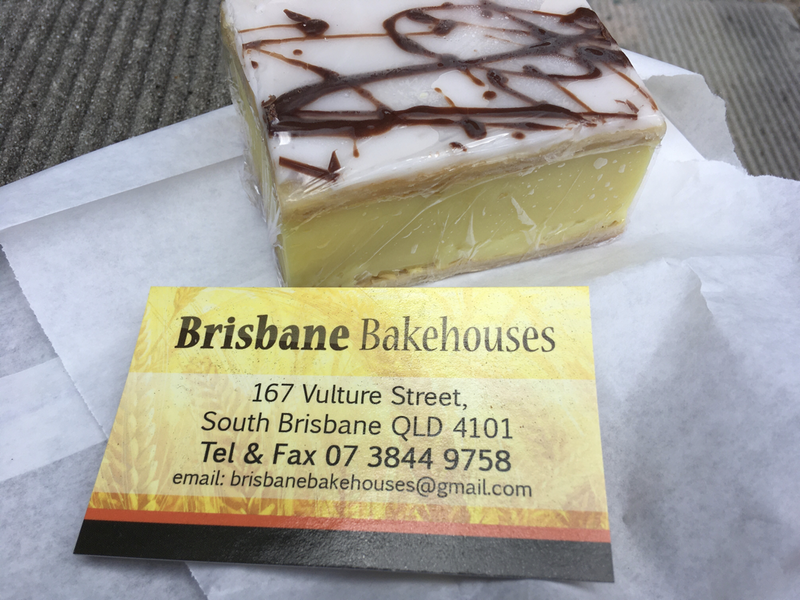 With only a vanilla slice in mind I had to ignore such items and paid the friendly lady a very small $1.70 in exchange for a very small vanilla slice. As it turned out, I’m pleased this wasn’t a door step- seized slice selling at $6, as you will read. Firstly, the custard was a complete red herring; appearing creamy and rich, in fact it was nothing more than a vanilla flavoured powder mix set with copious amounts of gelatine or equivalent thickening agent. It felt rubberised and was not overly pleasant in texture. The pastry too looked very appertising upon inspection; obvious layers of puffed flaky pastry and a good dark brown colour. 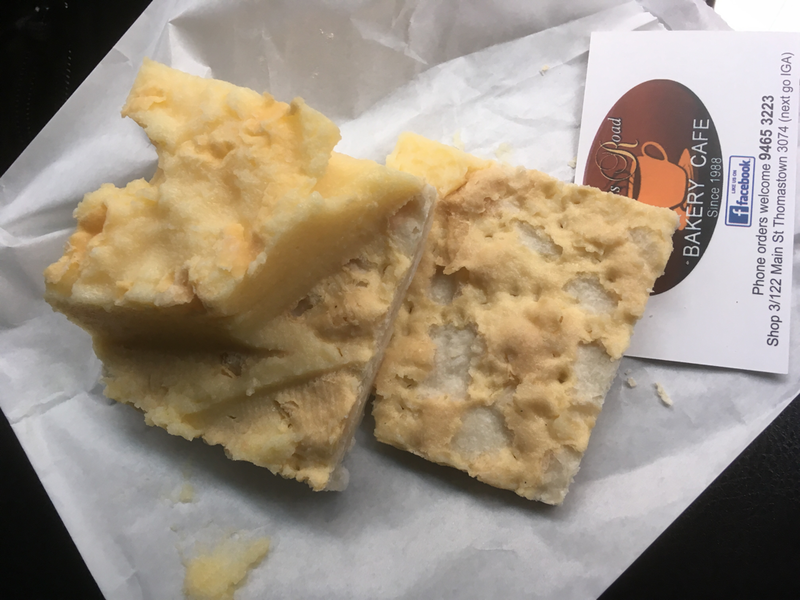 In truth, this was partly the case, but the pastry proved somewhat dry and lacking a buttery richness that results in a beautiful crunch and flake. Fresh at least. With little else to comment on, one can only really say that the size portion is a good for a nibble and very reasonably priced, but unfortunately the quality of the item wasn’t outstanding. 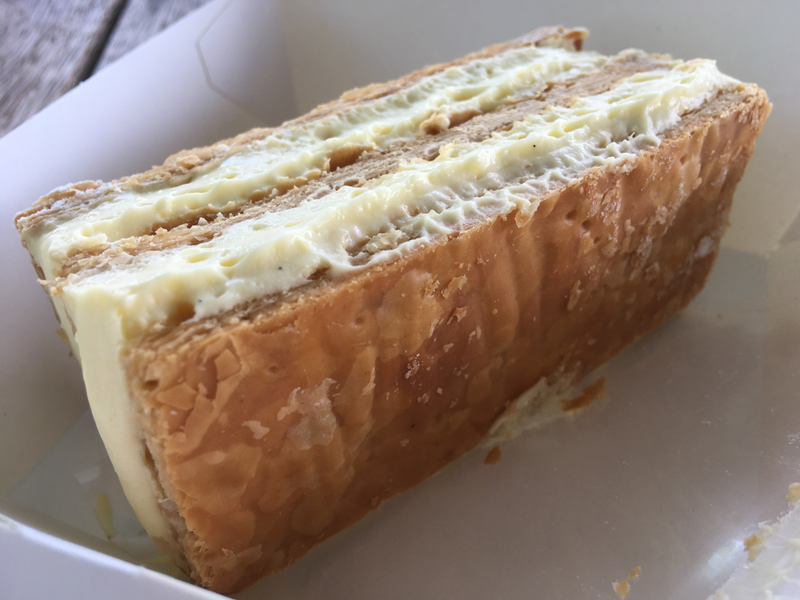 Selling at an average $4.50, I predictably took out one of their vanilla slices. With a 50/50 hunch that this may be stale I bravely picked the item up and tentatively took a bite. Greeting me with a noisy crunch the pastry was fresh and flaky...thank god! The pastry was in fact quite good; thinly layered, but crunchy and flaky when bitten. It allowed for seamless custard consumption, with little spillage to note. The custard, was mostly cream, with a hint of vanilla and some kind of additive powder. It was fresh, light and slightly better than average. The icing seemed to be a bit of an afterthought; heavy, grainy and loaded with thick lines of bog-standard chocolate. Sadly this left a somewhat cheap and distracting aftertaste in my mouth. 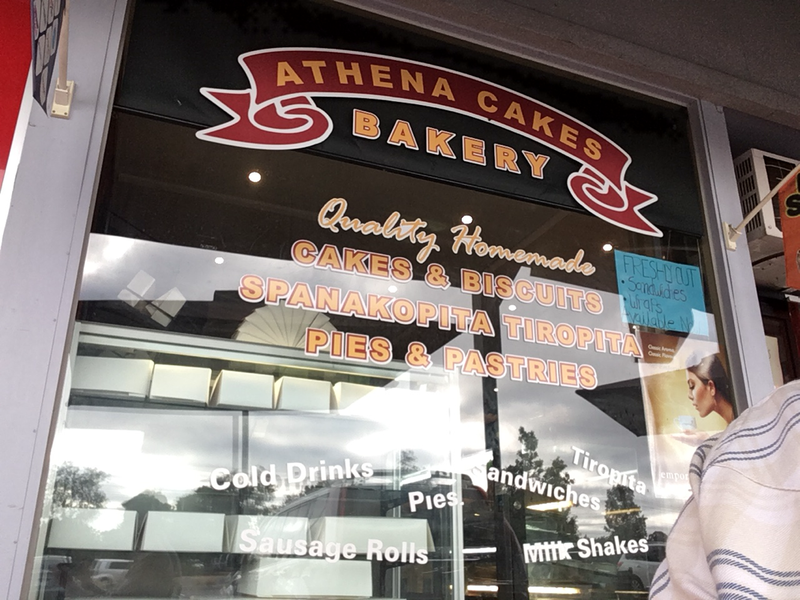 Athena should know (being all wise and inspiring) that the quality of ingredients is the most important thing when it comes to quality products such as the humble vanilla slice. I’m glad I stopped, but definitely room for improvement. 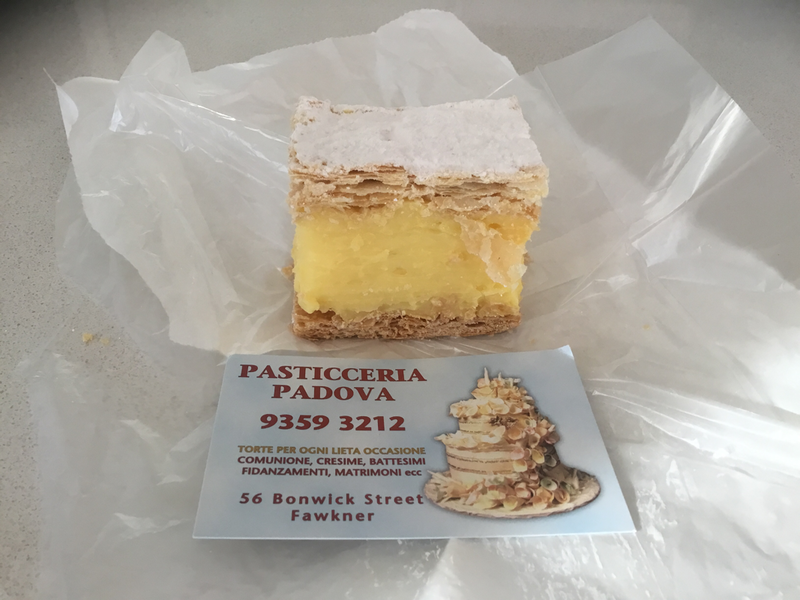 In a new pocket of Williamstown I had never ventured before, I stumbled upon this Aussie-Vietnamese bakery selling some pretty awesome looking vanilla slices. 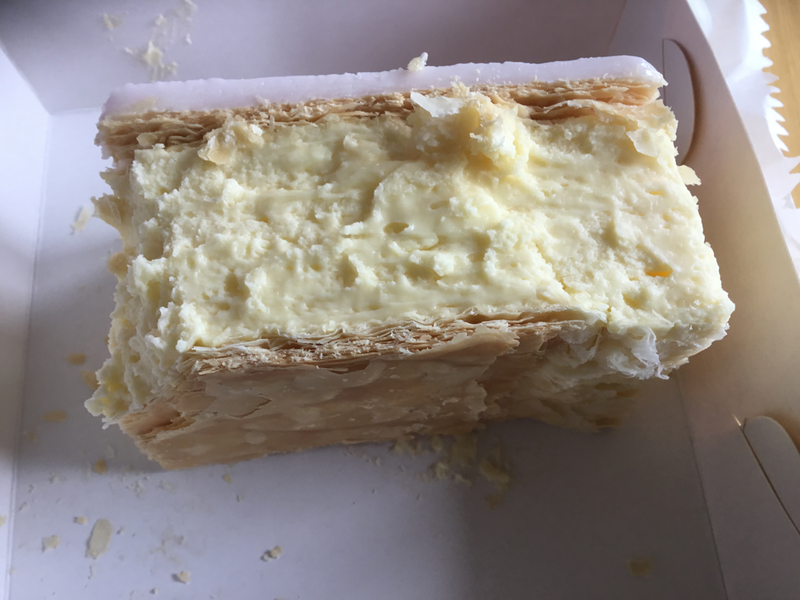 Large in size and hefty in thick white icing I opted for the more sophisticated French variety sat next door. With a clear bright red layer of jam inside I was eager to see what I’d got when I opened the bag. Sadly she didn’t fair too well in her short trip from counter to car and had lost the majority of the icing sugar and neatness from the display cabinet. 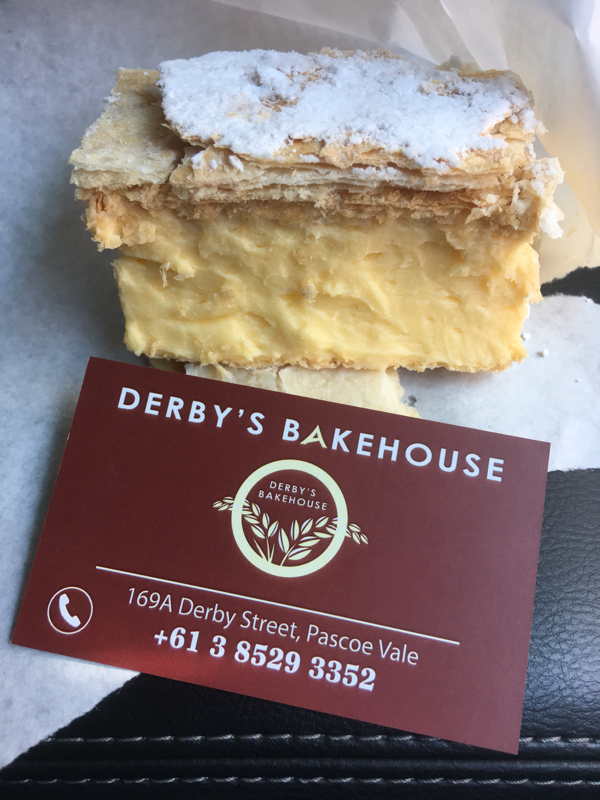 Nevertheless, I chowed down outside of my car (thankfully) and enjoyed what I tasted, the pastry was excellent; baked fresh on a Sunday and dropping shards all over the floor made me grateful for not being sat in the car still. The filling was pleasently creamy, light and with a hint of vanilla. The jam in truth wasn’t required in this ensemble and I felt it slightly overpowering in an already sweet offering. It tasted like a cheap strawberry jam, not an upmarket, sophisticated preserve like I’m used to! A great little find. With a name like Pastry Paradise I was slightly sceptical of what I might find here in the weird and wonderful world of custard based pastries. 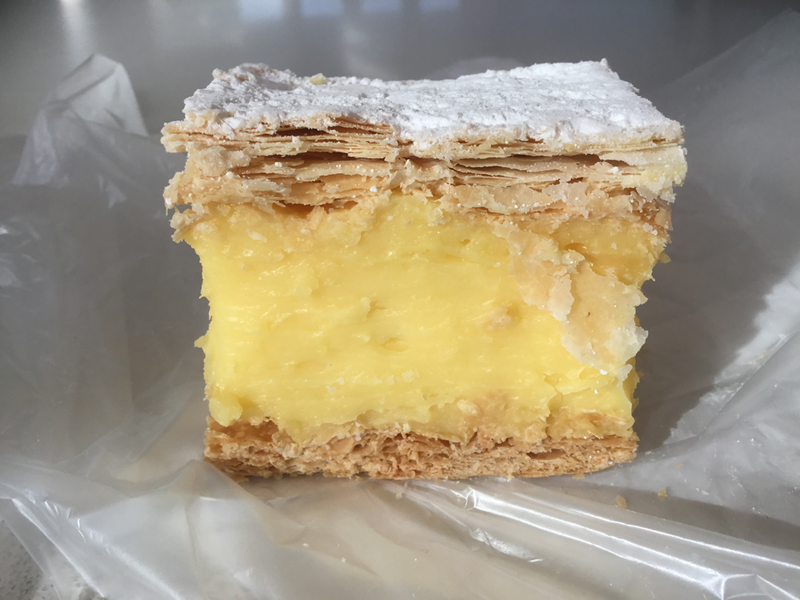 Nevertheless I saw what I came for (the Italian Vanilla Slice - Milfolglie) in their rather eye catching window display and headed swiftly in. 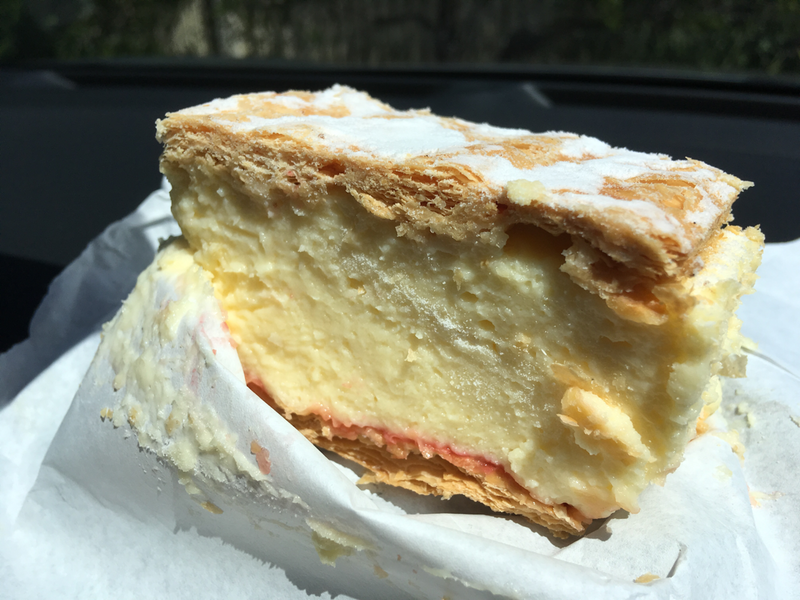 Taking out a half sized square shaped portion for $2.50, I headed back to the car and devoured. Needing to half the portion by departing the layers I held mini portions in my hand and instantly noticed the biscuit like crunch of the pastry. 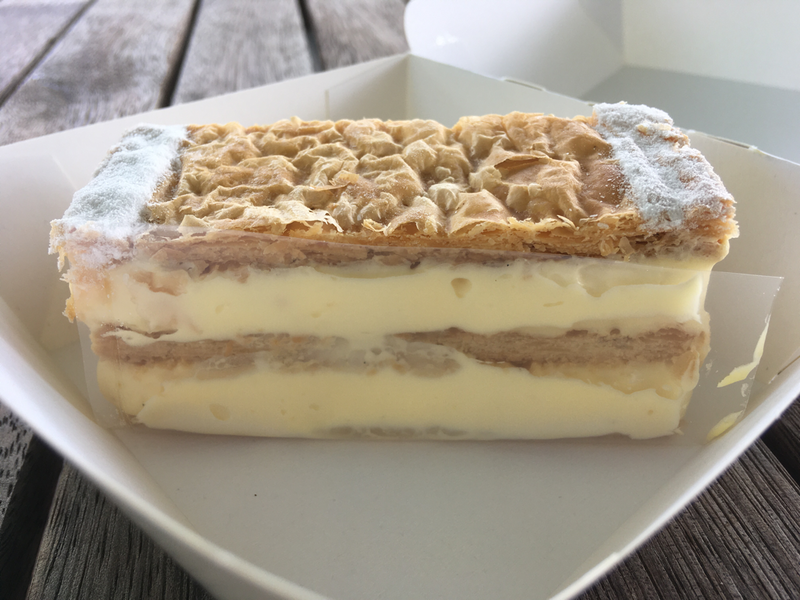 It’s uncommon to get pastry this good in most bakeries, so I really savoured this. The butter content must have been high as it was so crisp, puffed and golden. Truly wonderful! Quite reversely, the poor excuse for custard left me questioning where it all went wrong. Had this been a rich, eggy, vanilla custard adhering the heavenly layers of flaked goodness together the outcome would have been quite different. Sadly, this was not the case. The last time I drove up Derby Street six months or so ago, the Hot Bread Bakery had disappeared. Miraculously, this time round it’s reopened with a nice new shop refit and name. 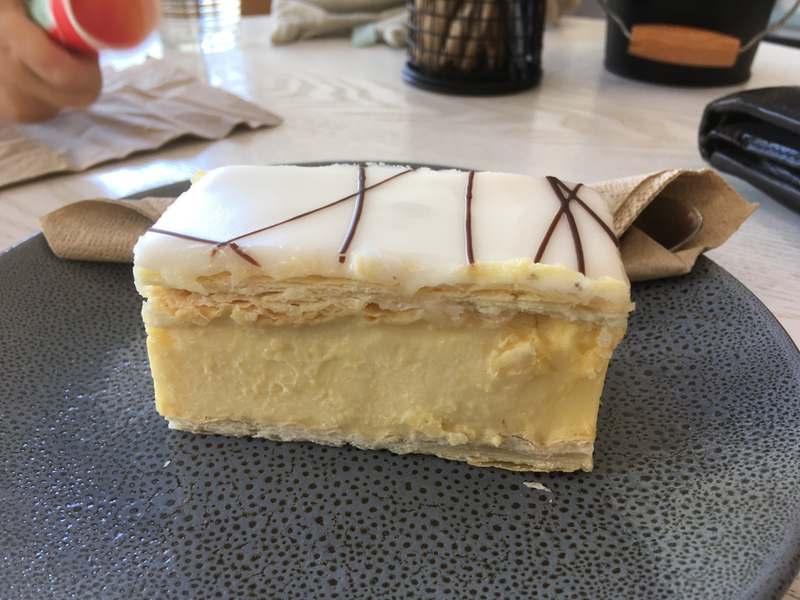 I was pretty optimistic when I saw the vanilla slices in the cabinet; tall in stature, flaky brown layers of pastry, a healthy dusting of icing sugar and a rich, eggy looking custard. 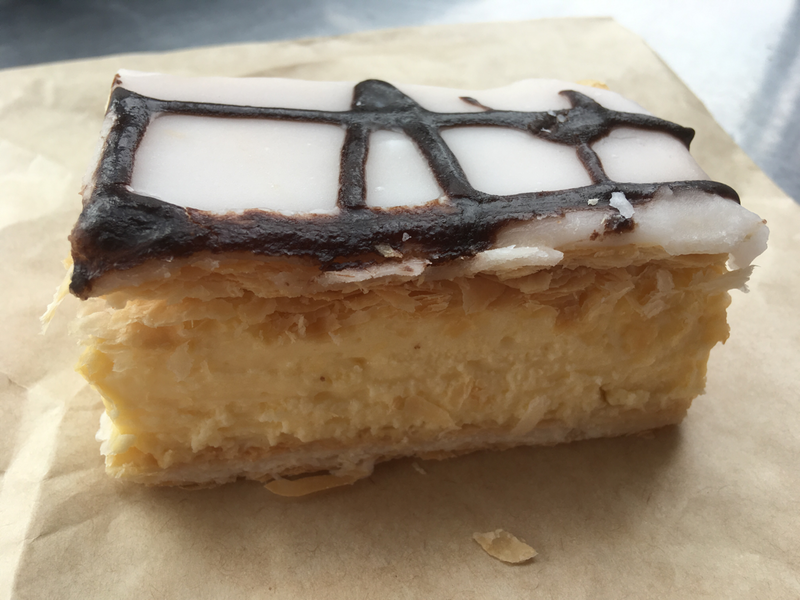 For Snot Blog consumption today I visited and left with a Melissa Cakes tri-layer vanilla slice. Impressed with the size, proportions and cost of this one, I unwrapped the thin foil and attempted a cut with a takeaway fork....with no luck. I was met with some resistance, but the pastry was quite puffed and not tightly baked. Instead I cut through the middle and ate the thing as two mini vanilla slices (one with the sugar on top). The pastry as mentioned was not the flakiest, I put this down to the lack of butter in the mix and the bake time in the oven. The custard was satisfactory; light, airy, fresh and with some vanilla, though not anything out of the ordinary. 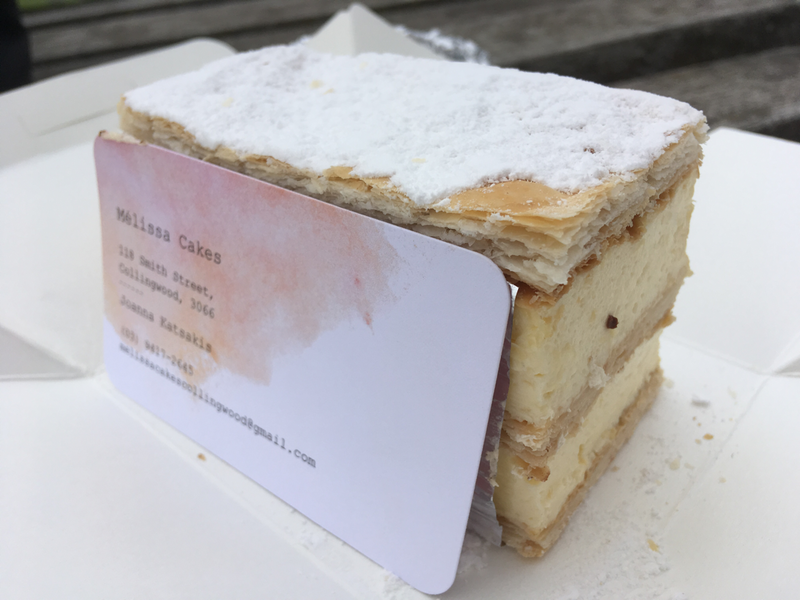 Had this come as a two layer slice I might not have been as forthcoming with my appraisal, but at least Melissa’s gives you a fair chunk of product for your money. 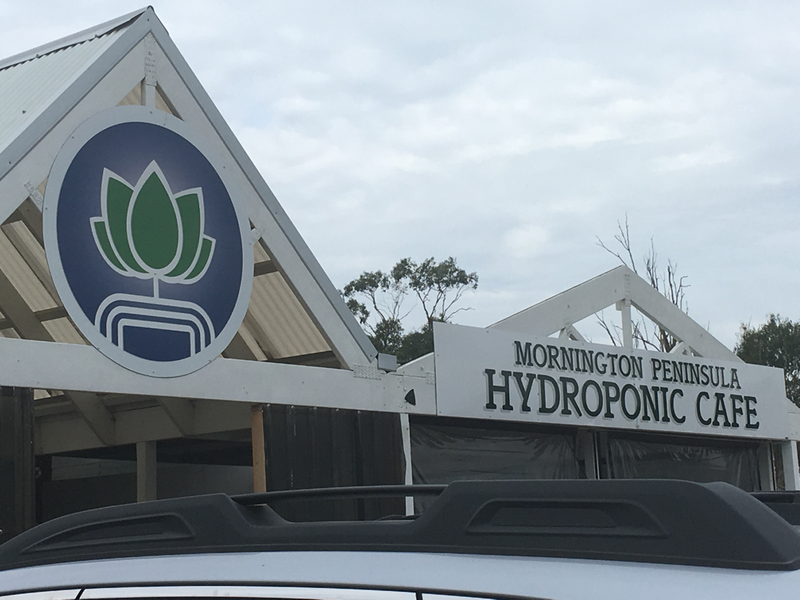 A brand new shopping village called Warrally has sprung up on the outskirts of Barwon Heads since the last time I went for a swim there a good few years ago. Conveniently, heading there again I pulled in and grabbed lunch before I got all sandy on the beach. 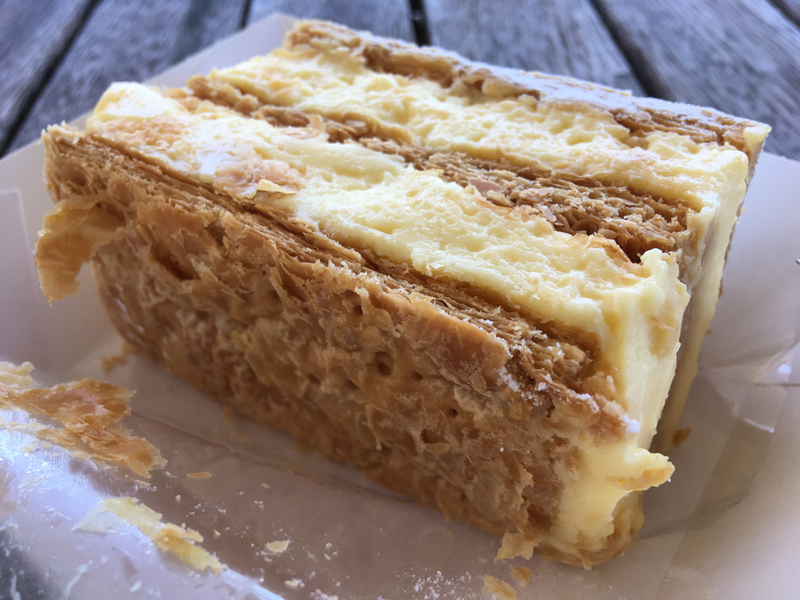 With only a few cafes to choose from, I headed into Sullies Kiosk and took out what appeared to be quite an interesting vanilla slice. I wasn’t sure at first if they baked their cakes, but I’d guess they use a supplier. The slice had real promise, with visible vanilla bean speckles dotted throughout the custard. The filling was creamy and quite heavy, but sadly lacking a vanilla flavour, even with the clear vanilla content. The pastry was at least a day old and soft. It flexed in my grip and made the custard flop quite precariously out the sides. If less dense I would have been wearing quite a lot of it on my shirt. The icing had a slight yellow tint, definitely not white. It’s flavour resesmbling white chocolate and again, creamy and sweet. In fact, the icing is what came through the most with each mouthful. 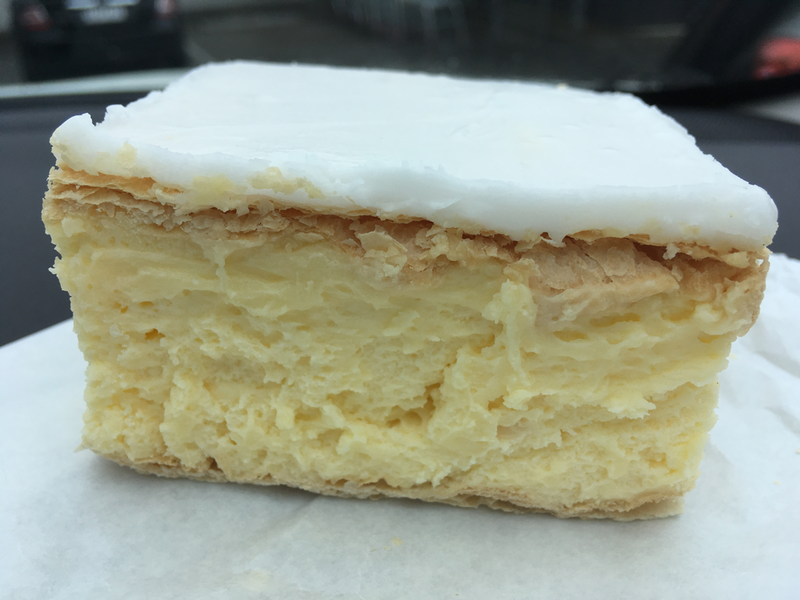 Potentially this should be called a white chocolate vanilla slice. I’d be keen to try another one when freshly baked and delivered to the premises. My final slice whilst in Blighty and not a great end to the trip. Flaky J and I halved the offering and reflected. It was clear the filing was whipped cream, but what I was not expecting was the heavy dose of additional sugar thrown into the mix. To make matters worse, the jam and fondant icing just made the whole thing a diabetic’s worst nightmare. The pastry was pretty lacklustre and because there were three layers of the stuff it made biting through quite a tricky and messy exploit. Similar other slices I’ve tasted recently, there is a severe lack of quality in some of these puffed or flaked efforts. The raspberry jam was OK but unnecessary with this much sugar. I’m pleased we shared this one as I’m afraid I would have had to pass. With low expectations for the outcome of these frozen vanillas, myself and Flaky J (back on the scene over the festive break) sampled the goods. Noticeable from the outset was the short, squat appearance of each slice, with thick pastry in relation to the supposed custard filling. Left to defrost for the recommended 45 minutes, I bit through and felt sensitivity of my teeth with the ice cold middle. 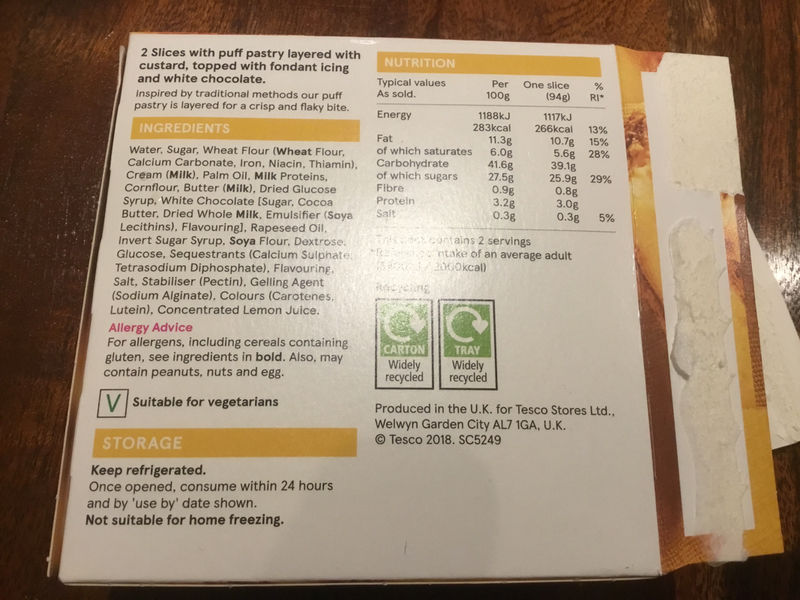 The pastry was obviously concocted to avoid sogginess from the freezing and thawing out process and had the consistency of tough bread and a taste that resembled digestive biscuits - but not in a good way. The icing was too thin to add impact and started running when picked up, so clearly doesn’t like being frozen. Altogether, I was right not to have high expeditions. Flaky J’s assessment - Flaky J was too upset to comment. 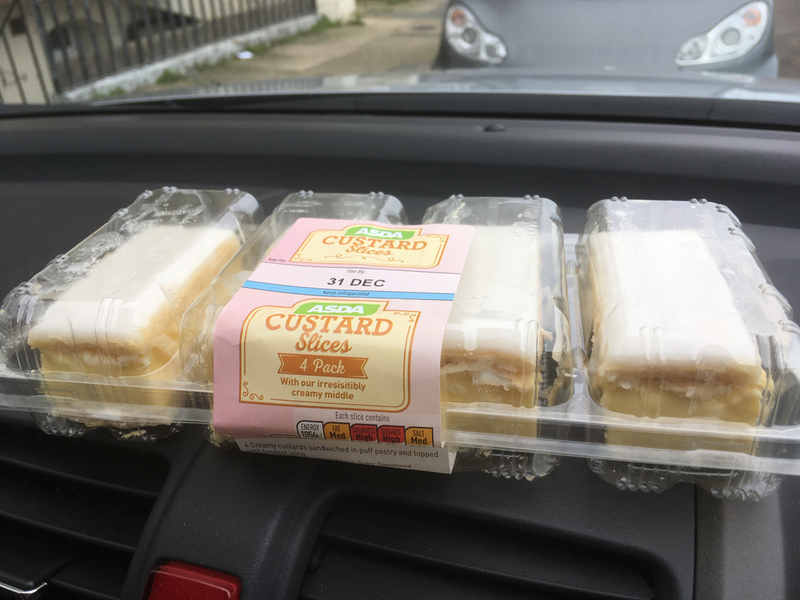 So attempt 2 saw me and Flaky J take out a four pack of Asda’s fresh custard slices. 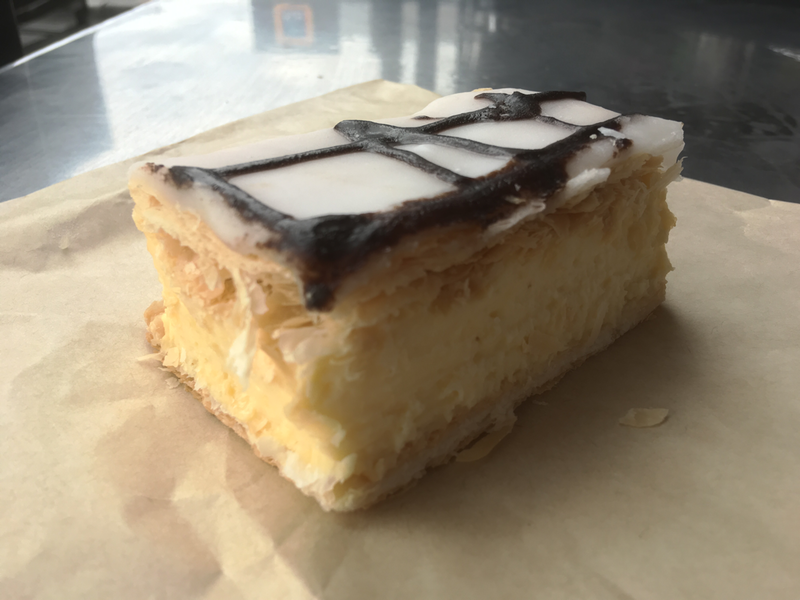 Though technically not a vanilla slice, it’s the same thing in most instances. 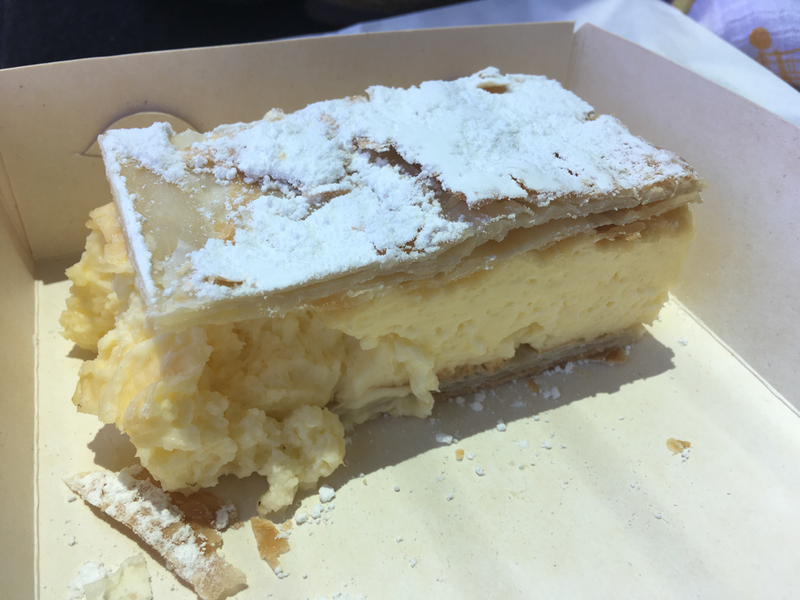 An instant improvement from the disastrous frozen attempt, these boys contained smooth, thick, creamy custard (though somewhat flavourless) and the pastry could be easily consumed without chipping a tooth. Sadly the pastry was soggy, but at least it was pastry. The real highlight was the soft, white icing that heat formed on my fingertips and required a good lick to remove. 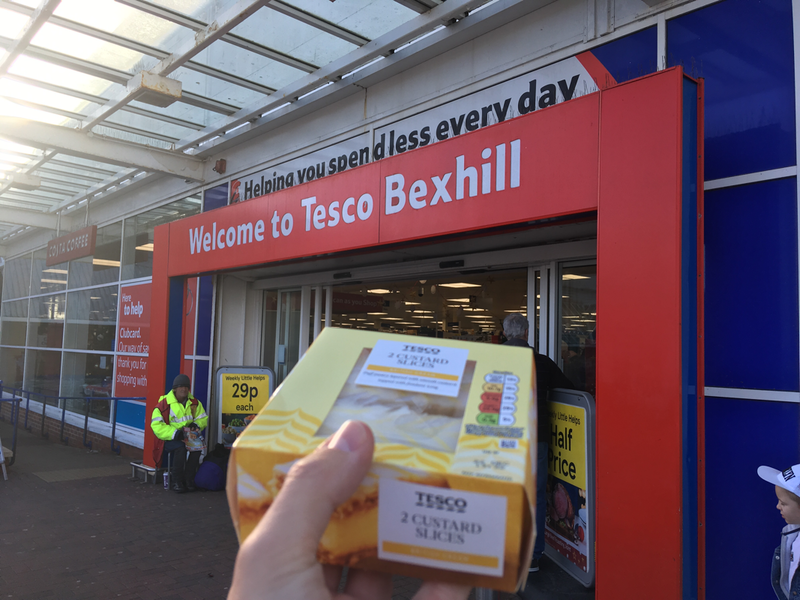 Shopping for groceries in nearby Bexhill-On-Sea, I stumbled upon Tesco Supermarket selling a custard slice. Naturally, I was game to give them a go at an affordable double pack costing just £1.30. I can compare this to a pre-packed Coles equivalent, with a prediction of soggy pastry and sticky icing prior to unwrapping the goods. 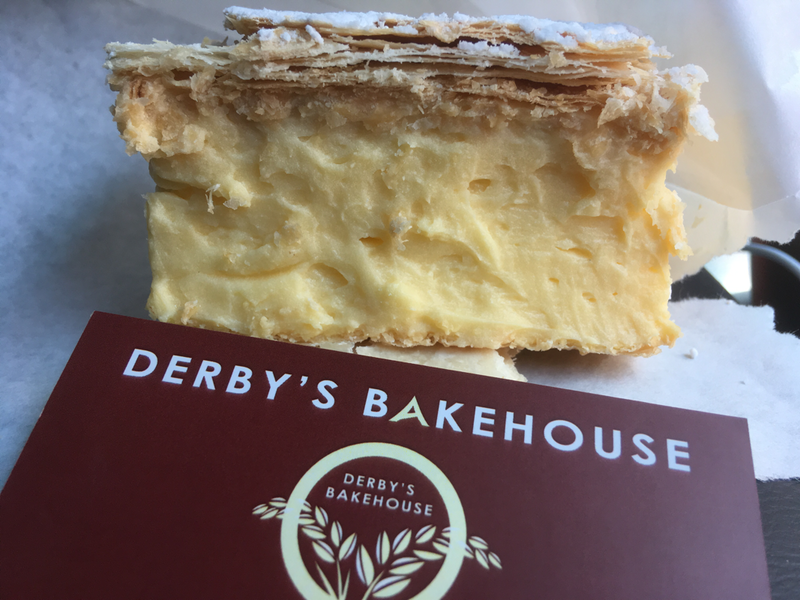 Quite accurately, the whole slice had a slight wobble to it, due to to the soggy layers of pastry and partially set custard filling. Upon first bite I was quite happy to taste a creamy, not overly sweet custard. Though lacking vanilla content and a loose texture, the actual makeup of the filling was OK. The pastry was thin, but far from crunchy. It lacked flavour and distinction but aided the transportation of the custard suitably. The icing was indeed sticky and performed quite well. Two for the price of one is good value I guess, but I’d rather have a pre-packed Coles version when back in Oz. Back in the motherland and on the South East Coast for the festive period, I immediately hit up the local Oak Bakery. 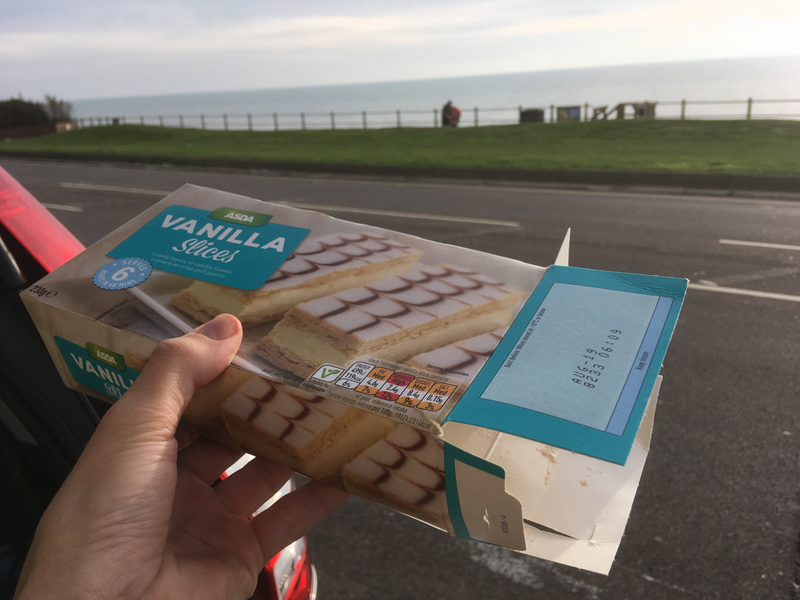 Selling a vanilla slice for less than a pound, I took this lighter than air assembly to a nearby car park with a cracking seaside view. 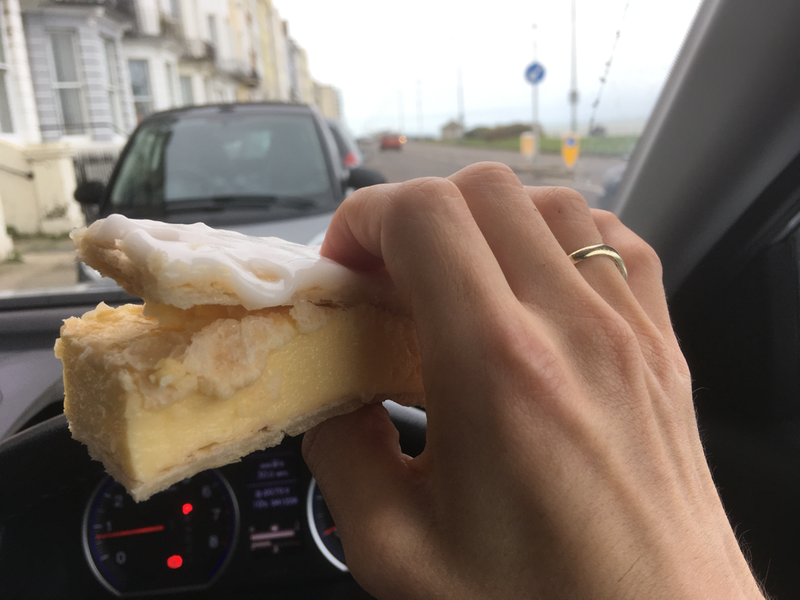 Blowing an absolute hooley outside, I braved the gale force wind and chomped on the slice outside of the car. Thankfully so, as after the first bite, I lost a third of the filling, with my trousers wearing some and the rest on the ground in a sorry heap. The cause was rigid, unforgiving pastry lacking any flake or richness. It squeezed the air like whipped cream filling out with ease. Oddly enough, the whole slice tasted very little of any flavour worth mentioning. I ate what could be salvaged, but left feeling saddened by the mess on my trousers mostly. Regulars to the Blog, or even those with a hint of nous might have predicted the outcome of this review based on the photo below. I have to admit that the vanilla slice didn’t look quite as bad when it was on display in the bakery, but sadly lost its icing sugar during transit home. Nonetheless, proportionally this slice is poor, with a heavy pastry to filling ratio. Not only that, the custard itself was more gelatinous than necessary, slightly crusty and cracked round the edges and lacking notable flavour. The thick layers of pastry were not tightly baked or crunchy, more of a softened texture that really didn’t offer much to the slice. Selling at $4 there is little value for money here; poor ingredients, execution and fulfilment. Due to its small size I did eat the slice, but had it been bigger it would have definitely been a throwaway job. 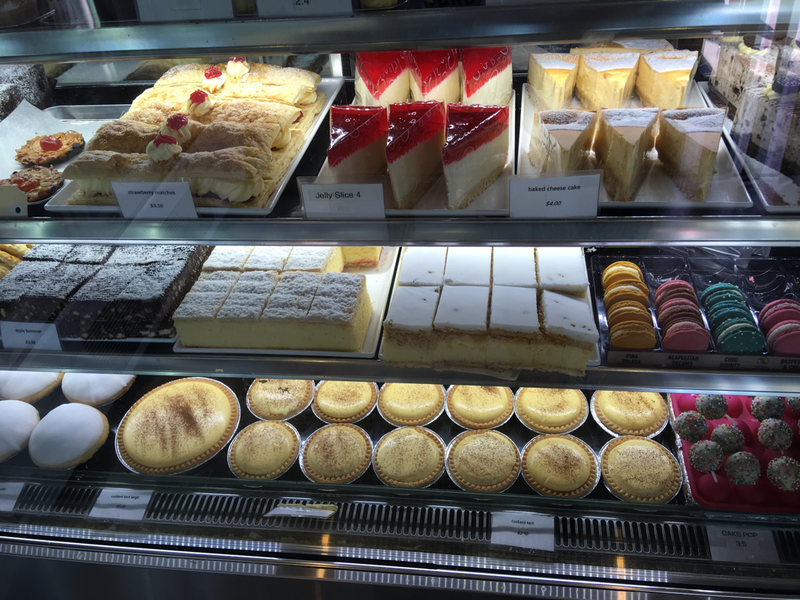 I was quite excited heading to Caulfield, with a planned pit stop in a local Danish-inspired bakery. Upon receiving my item I was quite surprised to see the state of it within the box. 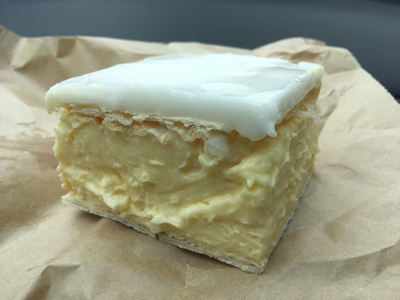 Looking like it had fallen off a plate and been picked up again, the custard was smooshed out the side, the icing sugar had partially disappeared and what lay beneath looked decidedly translucent. 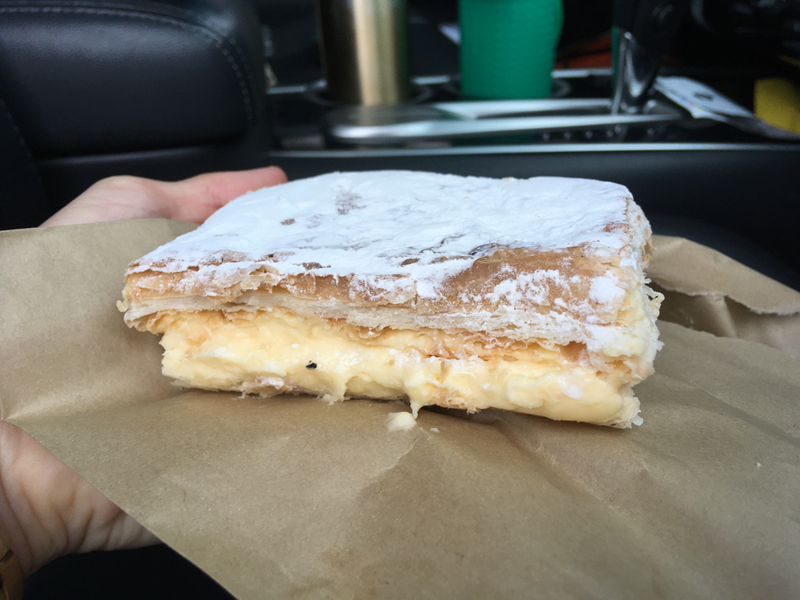 Upon my first bite, I was immediately faced with what felt like a slab of thick, tough and fatty pastry, with no crunch whatsoever. After a few bites, the custard had escaped from the other side, so I pretty much just ate the custard and left the rest for the bin. The custard itself was OK; light, fluffy, creamy and with a taste like vanilla ice cream I used to get in a soft serve back home. All of their reviews read positively, so hopefully their other items are better than this! After a solid morning of rain, there was no sign of it letting up, so I decided to stop in Montmorency village to grab a sandwich. I also couldn’t resist one of their homemade vanilla slices, on display as a slab and looking far too good to ignore. 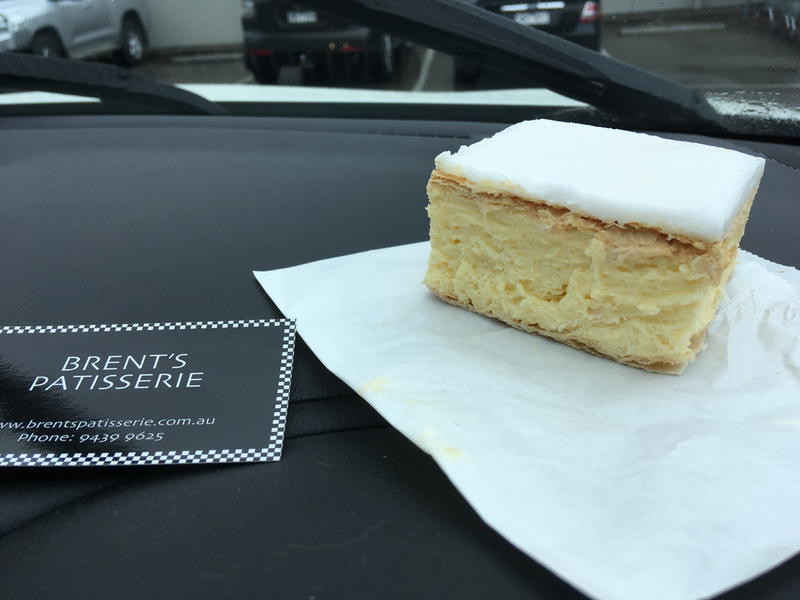 Having already eaten the monster from Brent’s Patisserie in Eltham earlier in the morning, this really was just gluttony. I took the slice home where I continued to unwrap and pull this similar sized specimen apart. Much like the slice from Eltham, the filling was huge and the icing almost 3mm thick, but with a hint of pink (purely aesthetic I later found out). 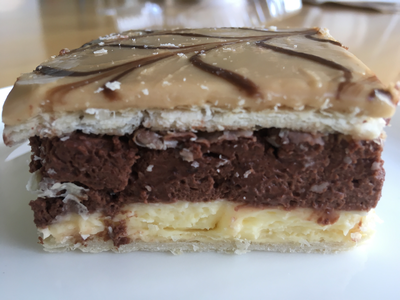 The pastry was possibly better than my first slice of the day, even more flake and a tad darker in colour. It’s a shame I had to lose some from avoiding the sugary fondant towards the end, as it became just a little too overbearing. The custard was similar in taste and texture to Brent’s, but potentially slightly heavier and with less vanilla content - but still extremely good by most people’s standards. 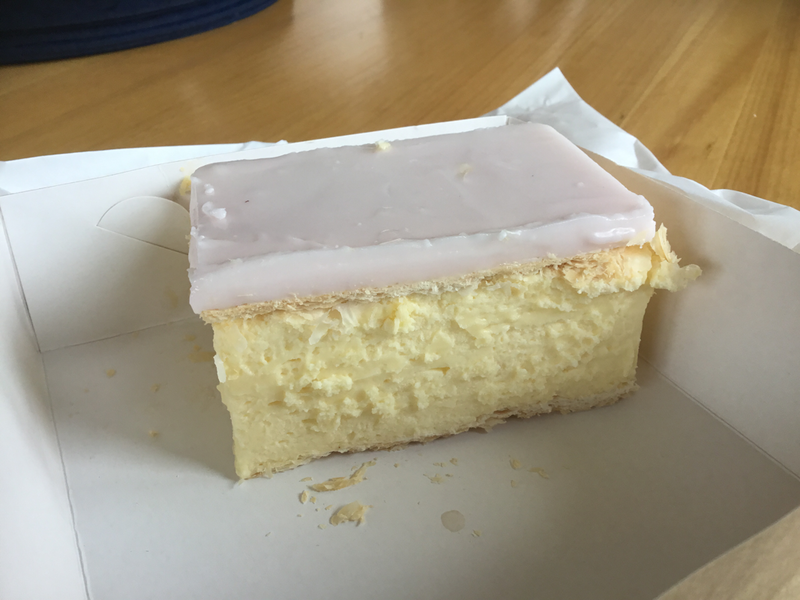 What a shame the icing brought this slice down, a third of the thickness would have sufficed and if the pink had been a hint of strawberry or raspberry it could have been quite interesting. Well worth a stop if you’re in the area, and the retro value of the old Milkbar is also worth mentioning. 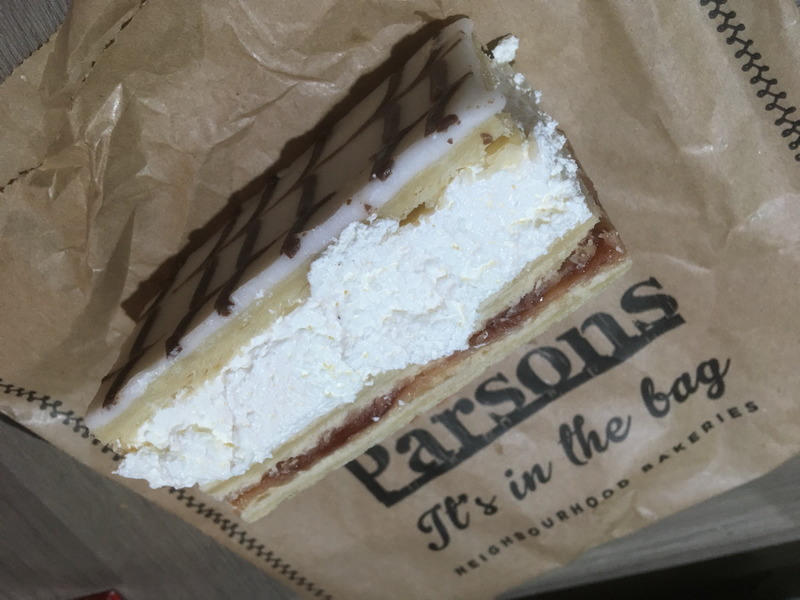 Regular readers of this blog will know that I have an issue with bakeries using the word ‘patisserie’. However, this time round Brent is well entitled to use such a term. 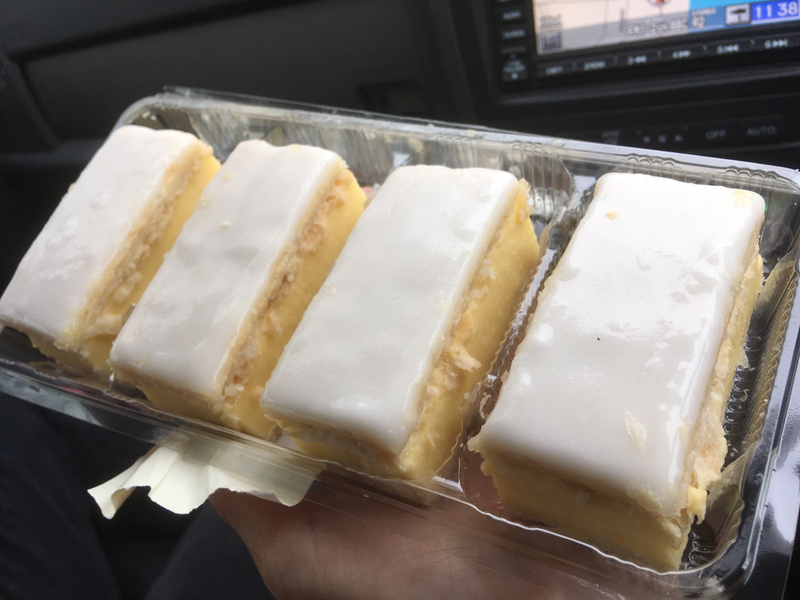 My vanilla slice was outstanding. Selling at a very reasonable $3.80 it was proportioned for the fuller gentlemen and was quite an effort to complete. Nevertheless, I endeavoured and my moustache took a hammering, reserving some custard for snacking later on. The custard was delightful. A really rich, creamy and whipped texture, not overly sweet and packed full of vanilla. There was a mound of it too, hard to contain once I got under way and the potential to make a real mess. The pastry was deceptively crunchy, baked in thin, compacted layers and gave the slice a great platform to pick up and eat freestyle. One only slight negative was the thickness of the icing; though in actual fact the sweetness offset the richness and creaminess of the custard quite well. A real triumph in the North. 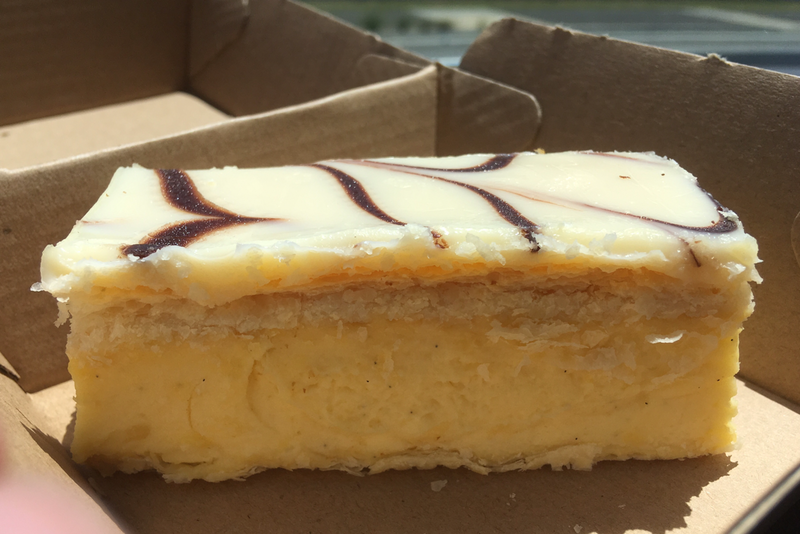 Selling at $4.50 this whopper of a vanilla slice could have been a catastrophic waste of money or a moment of magic. Well actually, it was neither...let me explain. 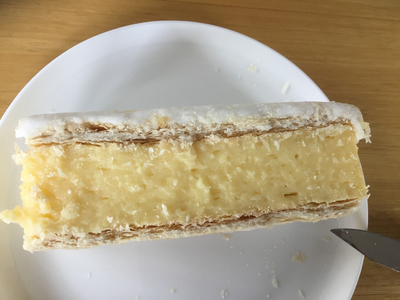 In cutting the slice on its side a welcoming resistance and crunching sound made me aware of a half decent pastry lurking inside. Whilst only a pale colour, the layers were tightly baked and fresh, allowing a good crunch and flake. The custard too was better than expected; a thick, creamy, smooth texture with only a hint of gelatin and packed with vanilla flavour. 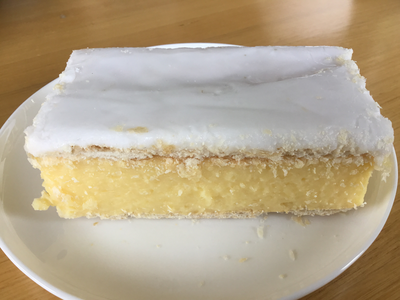 Admittedly the icing was a bit cumbersome, thick and hard to break through, but it didn’t detract from an otherwise decent effort. It was only after four or five mouthfuls that I reached half way and stopped. Morning tea sorted for the next day, all for the handsome price of $4.50. Not bad. 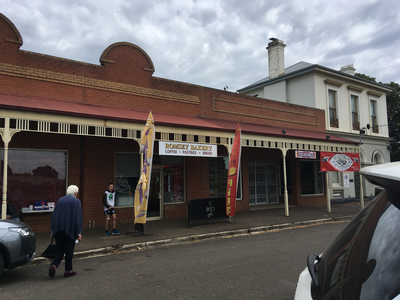 It’s rare that I drive through Woodend and don’t stop at Bourkies. 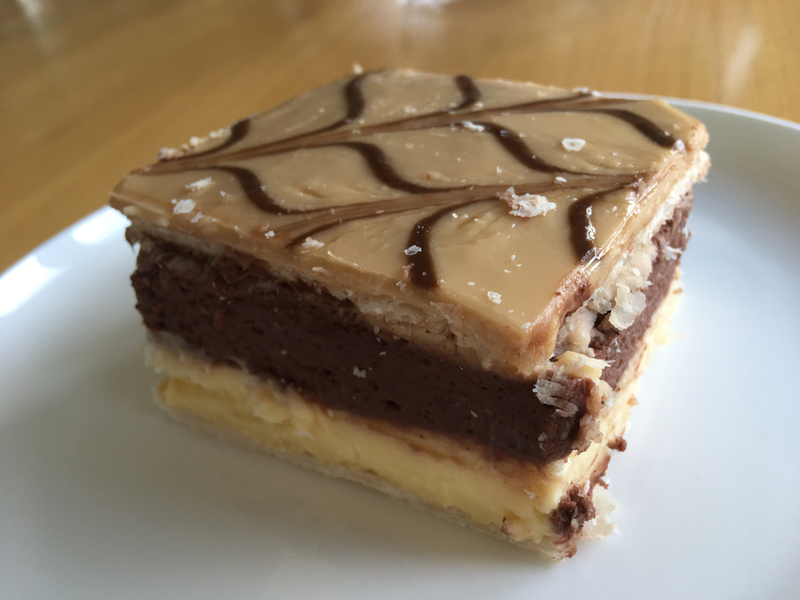 In five years doing the Blog, the mocha vanilla slice has always eluded me. I’ve smashed all of their other varieties (vanilla, strawberry, passionfruit, raspberry fusion), all with excellent attributes. In finally taking out the mocha slice, I couldn’t help but feel disappointed. 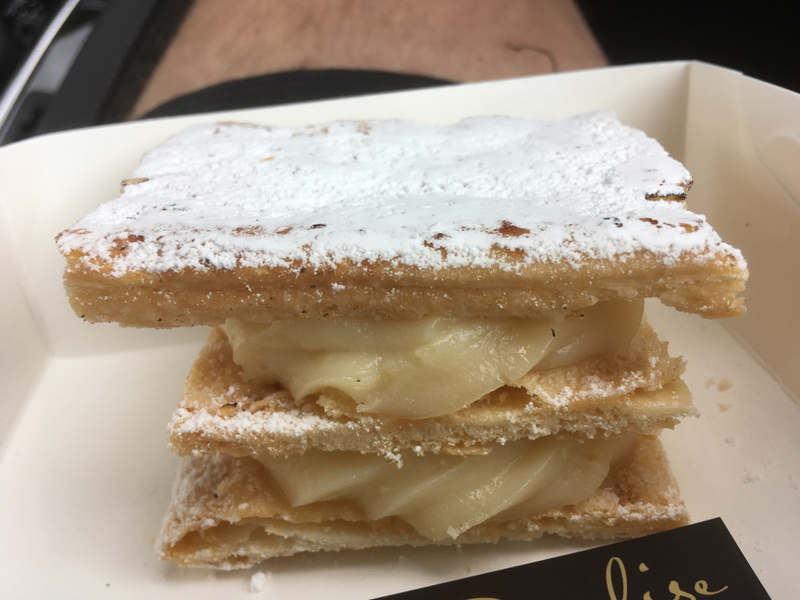 I’m not sure if Bourkies are using different pastry, or they were just having an off day, but the two sheets in this offering were lacklustre, soggy and barely baked. The chocolate mousse was really quite tasty; airy, sweet and a rich chocolate flavour. It worked well with the sweet, but still slightly bitter coffee icing, producing the mocha flavour as advertised. Hidden in the ensemble was still their traditional vanilla custard that in truth got lost in flavour, but was still very welcome. I feel that $4.80 is too steep for this ‘artisan’ variety and coupled with the poor pastry today, it really should have been more memorable for the right reasons. Romsey Hot Bread Bakery was my pit stop while driving to Edgar’s Mission. 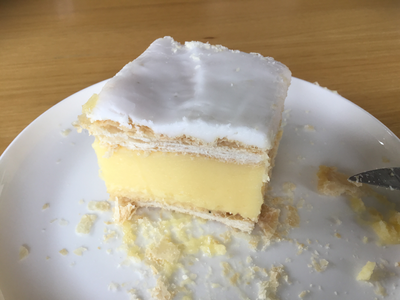 I took out a half decent looking vanilla slice, though dubiously pale looking pastry could have gone either way. 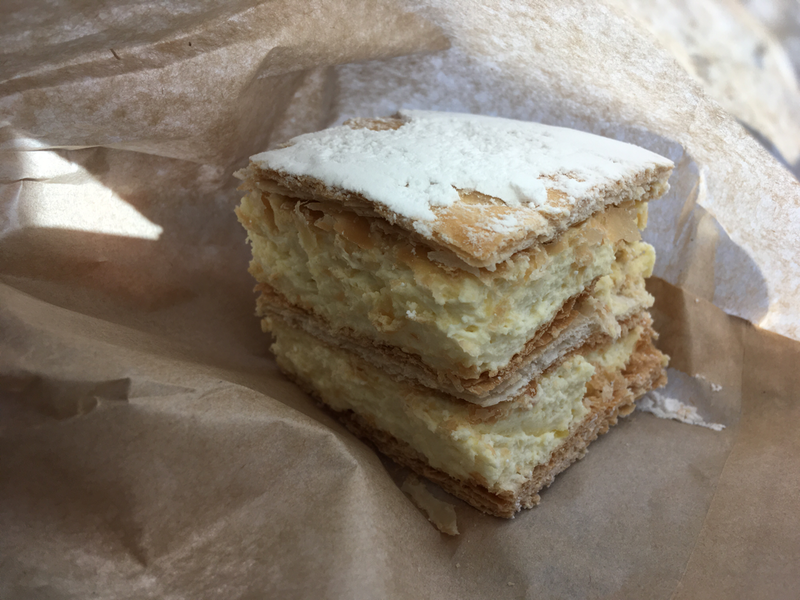 When handled, I immediately felt the somewhat soft pastry, though I left my judgement for the bite and taste tests. 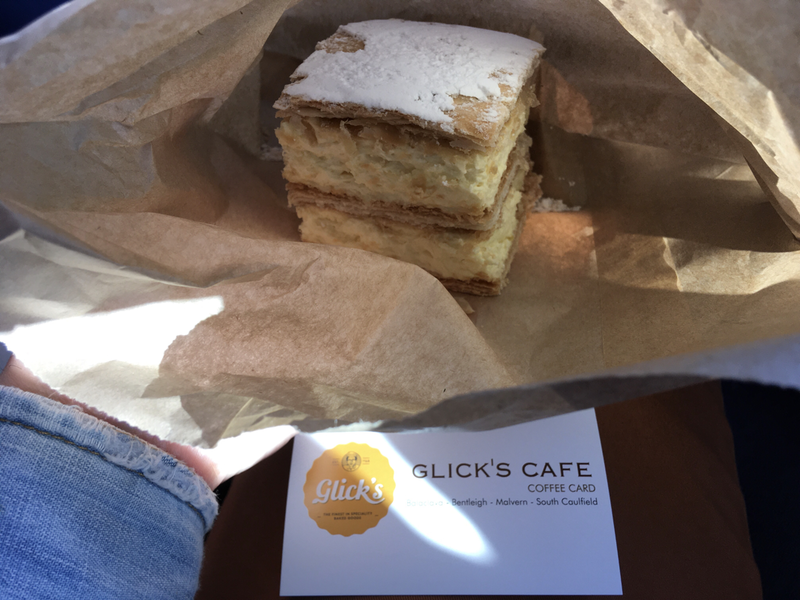 The pastry was not awful, though it was a million miles from being buttery and flaky. It handled sufficiently to allow large bites of all layers, with a heavy icing being very overbearing on top. The custard was actually nice; milky, creamy and velvety smooth in texture, with a hint of vanilla essence. A decent enough effort, but not as good as others I’ve tasted in the Macedon Ranges.